“ I did everything late. At the age of 40 I started going to discos. I got married at 45. 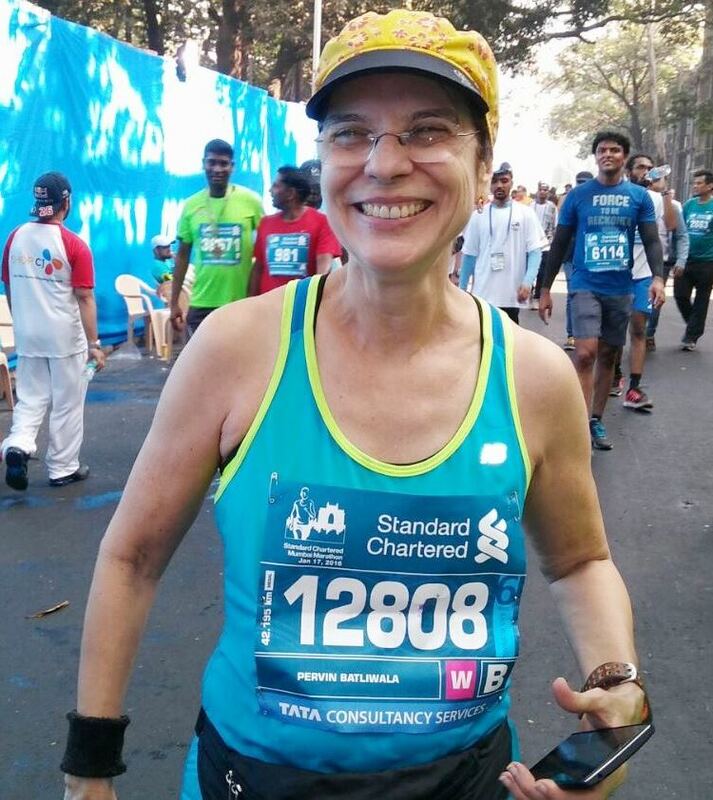 At 50, I started running and at 60, I ran my first ultramarathon!’’ Pervin Batliwala said laughing. We were at her house, in a quiet residential area that a newcomer to Mumbai wouldn’t suspect existed. As you ascended the hillside next to Babulnath temple and walked into the colony of houses belonging to the Parsi community, a tinge of quaint personal space took hold. Yet Marine Drive and the access to Peddar Road and suburban Mumbai beyond were all close by. As combination of long flat road with plenty of ups and downs at tangents, this part of Mumbai would be prized real estate for any runner. It came in handy for some of Pervin’s training runs. For the bulk of her life however, Pervin who will be 62 in October 2016, didn’t think much of running. She was born and brought up in Mumbai in a very middle class family. Her father worked in a bank, her mother stayed a housewife. Schooling was at Bai Ruttonbai F D Pandey Girls High School in Tardeo; for college she attended Burhani College of Arts and Commerce at Mazgaon. Finally she studied law at Mumbai’s Government Law College. Then, she commenced work at Hindustan Unilever Limited (formerly Hindustan Lever Limited – HLL), the Indian arm of Unilever. HUL is an iconic company in the Indian corporate world. Not only are its products ubiquitous in India but working there was considered prestigious particularly in the early years of life by MBA in India. The company’s Indian headquarters sat tucked away in a sheltered lane in South Mumbai, on the edge of the city’s well known business district – Nariman Point. Pervin worked at this office as well as at premises in suburban Andheri. Many of her years at HUL were spent as executive assistant to top officials. Like others of her generation, she stuck on at the first company she joined. She remained with HUL till retirement. In school Pervin hadn’t been into athletics or games in the fashion expected of those seeking identity in such pursuits. She was an active person – that description suited her. From what she said, she appears to have always floated on a reservoir of energy and appetite to do many things. When she got around to doing something she had plenty of drive to dig into. On her visits to the city’s discos, she would dance through the night, all the way into the early hours of the morning. There appears to have been two other trends too. There was a turnover of activity in terms of variety plus, once something caught her fancy, she went after it diligently. “ I would take up something – like swimming, yoga, gym, Shiamak Davar dance classes – and go crazy about it,’’ she said. During her years at HUL, the company decided to invest in some level of daily activity for its employees, from a fitness point of view. Very close to HUL’s South Mumbai office was that Mumbai landmark – Oval Maidan. It is a vast playground, home to several simultaneously played cricket matches with a jogging track all around. In monsoon, when the cricket pitches become muddy and overgrown, football takes over. Amid city notorious for its ever hungry real estate lobby, this patch of land for play and exercise has survived, thanks to citizens who fight to protect it. HUL had stretching exercises and walk-jog routines for its employees at Oval Maidan. Among those who joined this group was Debasis Ray, currently Head – Public Affairs at Tata Trusts, who at that time worked in the corporate communications wing of HUL. He recalled, “ When Standard Chartered announced the Mumbai Marathon, many of us got enthused. The result – typical of HLL style – was a gym in the basement and a trainer who would train us at the Oval and Race Course. Pervin was part of the group. I too joined in. I recall Nitin Paranjpe, Prasad Pradhan and many others. 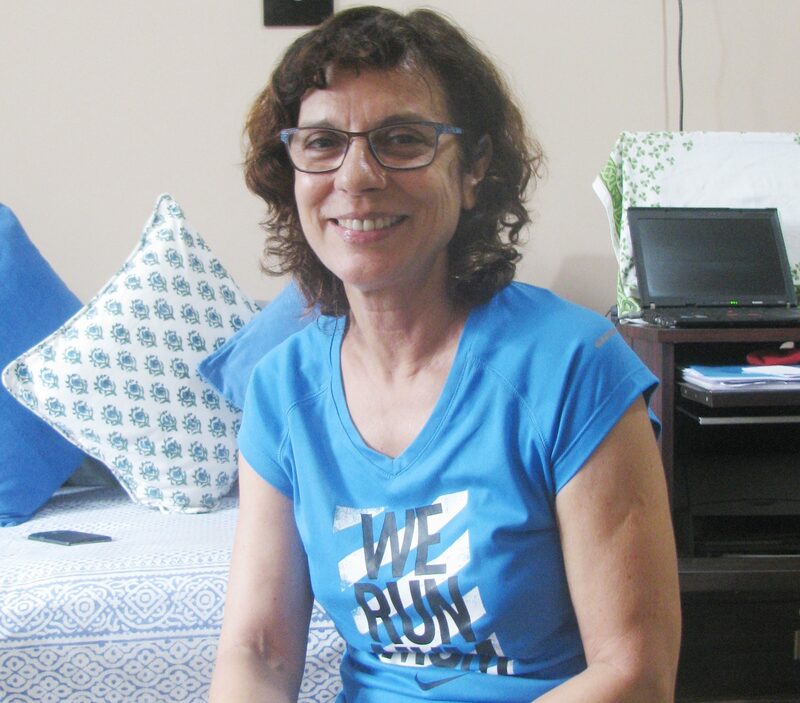 Pervin, I think, found out that running is her passion.’’ The person HUL entrusted with overseeing the training was Savio D’Souza, a former national champion in the marathon and one of Mumbai’s best known coaches for running. According to Pervin, one day, Savio suggested that the group go onto the road. That brought them formally to Marine Drive and its many runners. Pervin’s tryst with running had begun. Her first official participation in a run was the short ` Dream Run’ component of the annual Standard Chartered Mumbai Marathon (SCMM). The following year, she attempted the event’s half marathon. Well into the race, she ran out of energy. She “ hit a wall.’’ She couldn’t move. “ I was a gone case,’’ she said. Those days, you could get a refund on the timing chip but that had to be done immediately after the race. “ I wanted my money back,’’ Pervin said. Not to mention, finishing what she had begun was also important. She convinced Kushru – her husband – that she should somehow finish the race, walk if she must and get that refund. She did just that. Savio would later tell her that she had committed the mistake many do – she ran the first half of her race, too fast. But the coach told her that she would do well for she seemed to enjoy what she was doing. “ I was disappointed but I took it well. Savio said you will be able to do it, nothing to worry. That half marathon was a learning for me,’’ Pervin said. Savio’s observation was correct. That same year, Pervin ran the Airtel half marathon in Delhi. She won in her age category. In many ways that’s the Pervin Batliwala, Mumbai runners have come to know. She is a frequent podium finisher in her age group. So much so that Pervin honestly admits that in her retired years with ample time to train and attend races, she picks events where she has a chance for a podium finish. She enjoys getting prize money. Runner born, Pervin trained regularly. She ran early in the morning, a schedule she stuck to even when her work shifted to premises in Andheri entailing daily commute. The mileage she put in every day was modest. “ I used to do very limited mileage at that time,’’ she said. One reason for the measured approach was the findings of a medical test done ahead of joining the fitness-group at HUL. Pervin hails from a family with a history of arthritis. The test showed that her bone density was poor. However what subsequently played out was encouraging. According to Pervin, although she stayed cognizant of the need for caution, fact was – the more she kept running, the better she seemed to do at bone density. In all this time since getting into running, she hasn’t been laid low by any major injury. Slowly she transitioned to the full marathon. Such shifts, usually well thought out and momentous for others, appeared to be a breeze in her case. She doesn’t recall getting stressed by such transitions. Her first full marathon was at SCMM. “ I like 42. You don’t have much tension over timing in that distance. In 21, I feel the pressure,’’ she said. For several years after that win in Delhi, Pervin maintained an annual diet of races in Mumbai, Goa, Bengaluru and Delhi. The races spanned half and full marathon. By now she was also largely training on her own. “ Five days of running every week, one day rest, one day for cross training or working out in the gym. I don’t do too much of core and all that. I don’t believe in it. If I exercise too much, it goes into injury for me,’’ she said. Abbas Sheikh is part of Savio’s team. “ Pervin is a very good runner. She is absolutely inspiring. I have paced her on a few runs and I enjoyed running with her,’’ Abbas said. One of the interesting aspects about Pervin’s running is that she is gregarious in this activity too. She likes running in a group. 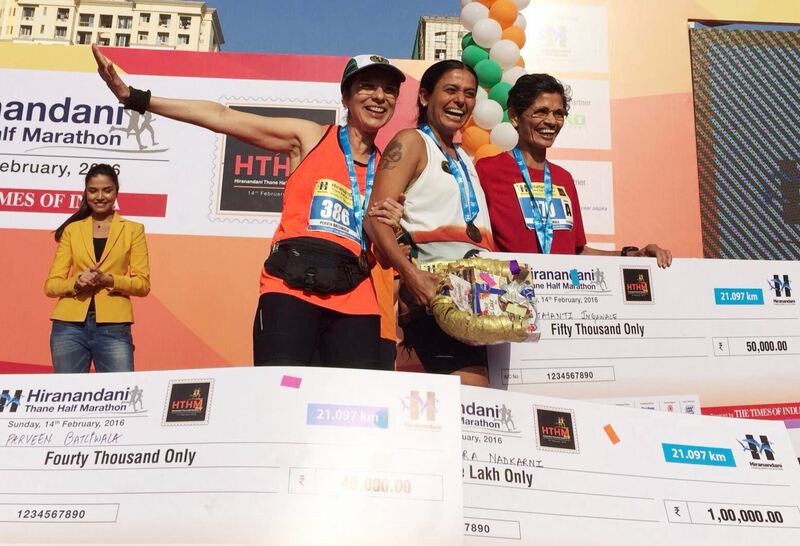 “ She always has a big gang of runners with her,’’ Parul Sheth, runner and author, said. A person who loves to chat, Pervin’s description of running and the affection she has for it included, talking and running. “ It’s fun,’’ she said of running as a group. Contrary and simultaneous to this is another trend in her – once she gets her fill of something, she moves on. When you have known what the half and full marathon are it is time for ` what next?’ Beyond both these distances lay a distance category, typically described by its inhabitants as discovery of personal space and extended dwelling in it – the ultramarathon. 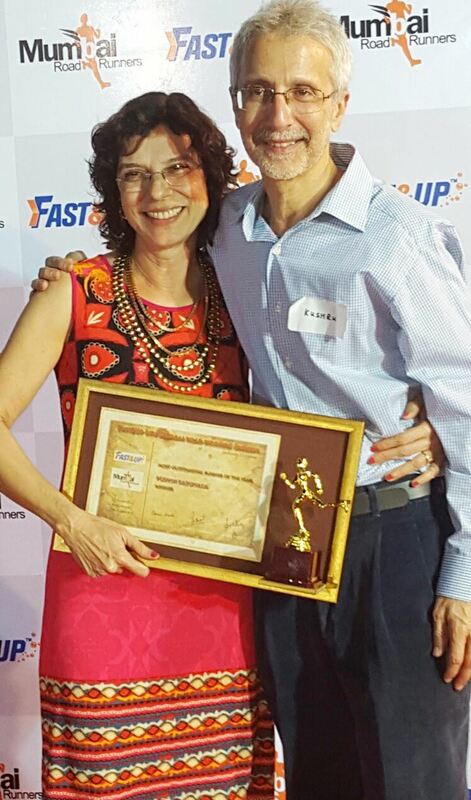 It was Amit and Neepa Seth who introduced Pervin to Comrades, the famous ultramarathon – the world’s oldest – run annually in South Africa. “ Once I hear of something, I try to get more details,’’ Pervin said. In March 2006, Doug Baille from South Africa had assumed charge as CEO of HUL. A keen runner, he had run the Comrades before. Pervin spoke to him to get an idea of the race. She also spoke to Savio, who planted an idea: run Comrades, the year you retire. She planned accordingly, registering for the race in the final phase of her tenure at HUL. 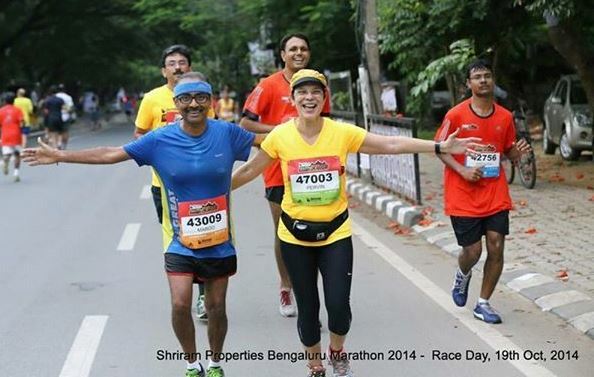 However at the SCMM full marathon, which preceded Comrades, she had an absolutely tough time. It cast a cloud on her ability to run the ultramarathon in South Africa. Comrades being significant, her family had also planned to fly to South Africa and cheer her. Now everyone suggested she postpone going for the race. Pervin was determined to go. She said she will proceed alone. Two of her friends – Sandeep Bhandarkar and Parul Sheth – came forward to help. Parul had first met Pervin when she joined Savio’s group. “ Pervin was already an accomplished runner. She encouraged me a lot in my running,’’ Parul said. Sandeep had created a weekly training programme. Parul’s job was to help execute it. Pervin’s first block of training, specifically for Comrades, was at Lonavla. That 56 km-run went off smoothly. “ From that day I didn’t look back,’’ she said. Savio’s group supported her wholeheartedly. “ I would put up my daily plan on WhatsApp and people would volunteer to run with me,’’ she said. Parul put the preparation in perspective. “ Pervin was determined to do an ultramarathon. She was ready for it. Her training was tough but she meticulously followed it. If she was supposed to log a certain mileage on a given day she would do that or more, never less. Seeing her train, I got to see another side of Pervin,’’ Parul said. As one’s interest in running grows or races become more demanding, eating the right type of food assumes importance. Rupali Mehta, dietitian and runner, planned Pervin’s diet. It also appears to have been training with a characteristic twist; that natural sociability was always around. “ I have to talk and run. You are running because you are happy, no tension, no thinking of anything, you are with friends – that’s how it is for me. I don’t like running alone,’’ Pervin said. In South Africa, the 89 km-race went off well for the now retired Pervin Batliwala. The ultramarathon – alternatively an uphill or a downhill depending on which year you run – is always spoken of for its several cut-offs and how they are stringently enforced. Pervin’s run went smoothly through it all. “ There is a saying at Comrades that if the winner is announced when you are half way through the course, then you will make it comfortably to the finish line. That’s exactly what happened for me,’’ she said. She liked the ambiance at Comrades and the way people turned out to cheer. “ Cheering is important. It gives you energy,’’ she said. Her friend to talk to while running Comrades, was Kashyap Modi. Savio’s group and her family tracked her progress on WhatsApp. She finished the race in approximately 11 hours 34 minutes. Then, in classic Pervin style she decided that having run Comrades and known what it is she must now look for something else. We asked if her continued appetite for challenge and podium had anything to do with conditioning by corporate life. Pervin dismissed that for the bulk of her employed years had been as executive assistant to senior officials; it is hard to get addicted to corporate instincts that way. What she does have is – she expects the best from herself. “ When I run, it is my race, my rhythm, my timing. I never try to catch up with anybody,’’ she said. She attributes her nature and the desire to challenge herself, to her own wiring. After Comrades what? The question hung around. “ I speak from the heart. I don’t think of what others may say,’’ Pervin said. There is a video of her, tired and happy, seated by the roadside talking her heart out. “ Comrades is nothing!’’ she shouts happily to the interviewer who had asked what she thought of that race, having completed her most recent one. The location is Leh in Ladakh, the high altitude desert just north of the main east-west axis of the Himalaya. Several years ago, Pervin had run a half marathon there, part of Zendurance. 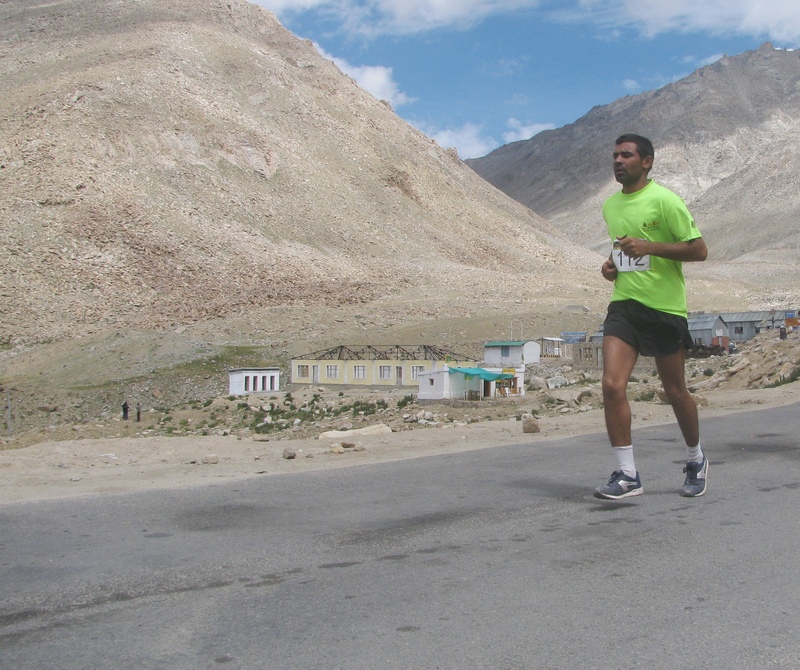 In 2012, Rimo Expeditions started organizing the annual Ladakh Marathon. 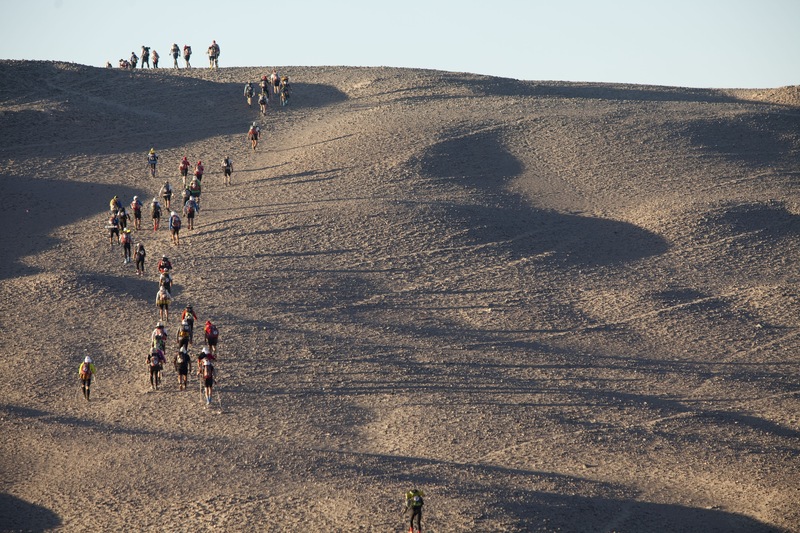 It had four disciplines, one of which was the ultramarathon called Khardung La Challenge. As a race it was tad shorter than Comrades, being 72 km overall. But with Khardung La (17,582 ft) included in the course, there was weather and altitude for challenge. Used to Mumbai, its warm weather and urban comforts, Pervin had her concerns. The Ladakh Marathon had a stall at the SCMM expo. She met the organizers and told them of her interest as well as worries. They said they would take good care of her. 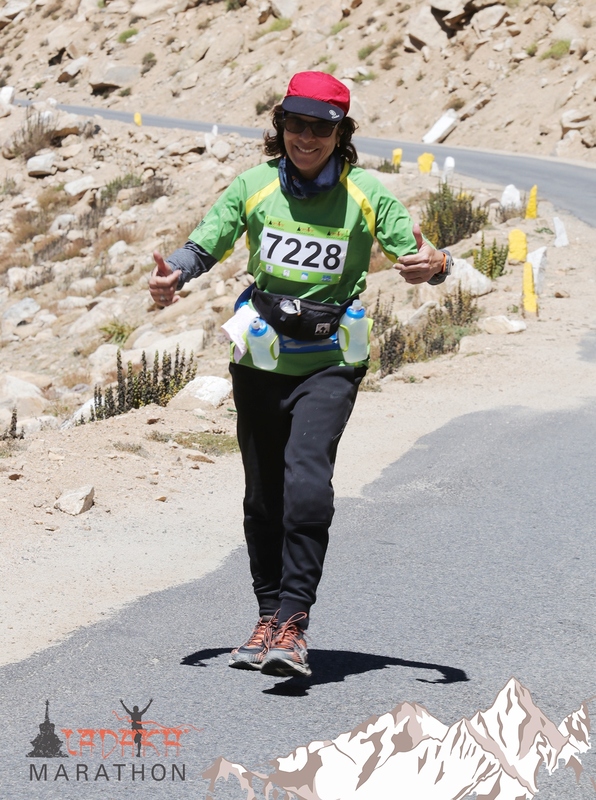 She registered for the Khardung La Challenge due in September 2016. New challenge found, she trained for it. The ups and downs of the hillside around Babulnath and Malabar Hill became training ground. To learn more about the race, she spoke to Khushboo Vaish, Nishant Desai, Dr Arun Nayak and Commander Sunil Handa, all of who had run the Khardung La Challenge before. 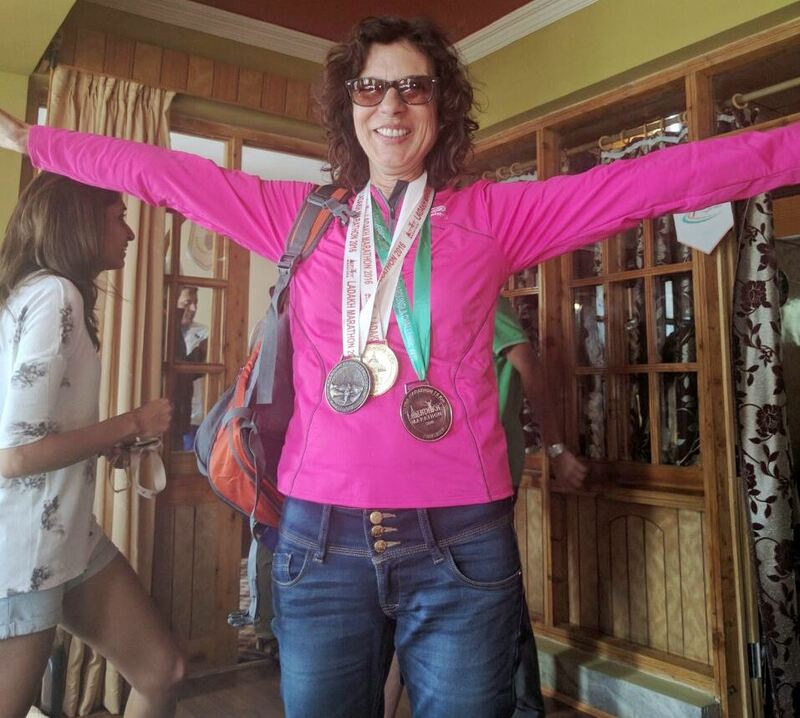 She put herself on a regimen of Diamox and reached Leh 15 days before the race to acclimatize. In that time, she did a three day-trek to the Gandala Pass, drove up Wari La for a further taste of altitude, proceeded to Nubra and returned to Leh via Khardung village and Khardung La. 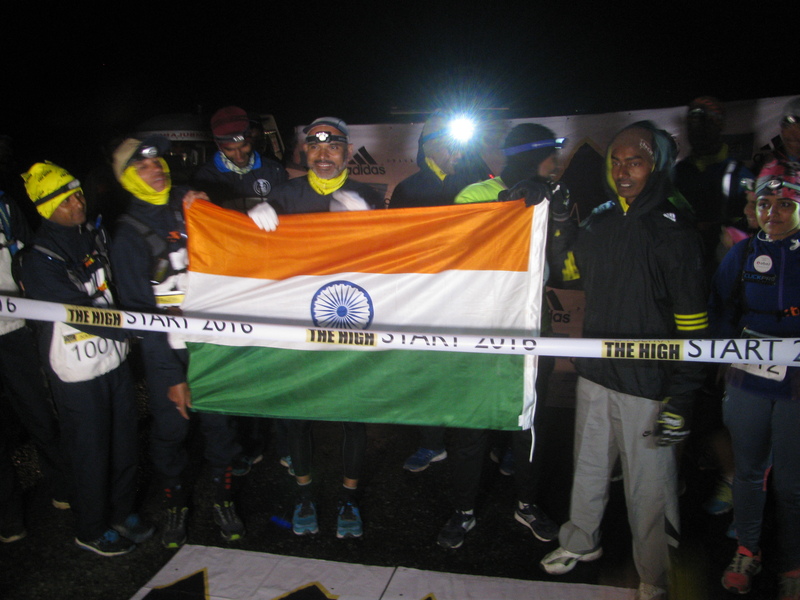 On race day, the run from Khardung village started at 3 AM. She approached the pass at brisk walking pace, a departure from her regular credo of never walking at any of her races. Thanks to good acclimatization, she had no problem breathing at Khardung La. Downhill was a chore. Pervin finished in 13 hours 15 minutes, placing third overall among women. She was the only one in her age category. There were reasons for that comment on video. At Comrades, Pervin had stayed close to the starting line in a comfortable hotel. The race began at around 5 AM, which is usual for most races. Khardung La Challenge was a different experience compared to Comrades. The 2016 race was well organized, it had adequate support staff and as the organizers – Chewang Motup and Yangdu Gombu – had promised in Mumbai, they took good care of her, Pervin said. Further, till noon, race day features a Khardung La road free of traffic, something runners appreciate. The difference she found was in how you reported for the race, which was a natural outcome of location. The runners headed the day before the race to Khardung village. They stayed in functional accommodation and endured a 3 AM-start. That was new for her. “ I was running on tired legs,’’ Pervin said. All that made the successful finish, sweeter. Comrades seemed a world away. It was time for: what next? In January 2016, on the return leg of the big loop that is the SCMM full marathon, somewhere near Churchgate, Pervin had suddenly sensed a truth that crept up unnoticed. With not much distance left to the finish line, she stood a good chance of making it home within the qualifying time assigned for her age category at the Boston Marathon. She gave that last bit of the race all she had and qualified. That’s her next project – the 2017 Boston Marathon. There is room for plenty of slip between the cup and the lip here – she has narrowly qualified and a lot of luck is therefore required to feature in the list the organizers announce. But Pervin hopes for the best. As for other dreams – she wants to attempt the Two Oceans race, try for a sub two hour-finish at the half marathon in Delhi, run one of the two ultramarathons in the Rann of Kutch and someday, attempt an Ironman. As yet, she has done a duathlon, a fun race with her running group. “ Age is what you make of it,’’ she said. Pervin has no sponsors. She wouldn’t mind such support. But she is also aware that she is too evolved in life to dance to anyone else’s tunes or mouth lines suitable to sustain sponsorship. Such stages in her life are over. “ After I retired I had many offers to work, return to corporate life. But I said no,’’ she said. This phase – the current one – is her chance to be free. 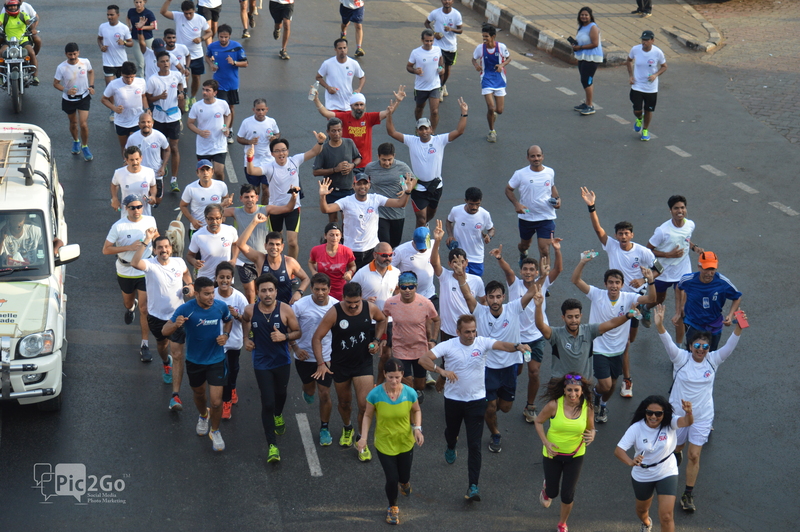 The monthly Bandra-NCPA run in Mumbai had just concluded and the runners were beginning to disperse from Marine Drive. First Girish Mallya and then Kutty Krishnan Nambiar informed that they were headed for the Gateway of India, to witness the conclusion of a landmark run. We had originally met this run as a stall at the expo preceding the 2016 Standard Chartered Mumbai Marathon (SCMM), nearly four months earlier. Gateway of India wasn’t far from Marine Drive. The reception for arriving runner was over by the time we reached. From Colaba’s Regal circle onward, we encountered runners who had been part of the receiving team, returning. The immediate precincts of Gateway of India too were relatively empty, it being a Sunday morning and as yet early for the regular inflow of tourists and hangers on. A runner directed us to a small, compactly built woman standing to the side, away from any attention lurking around. That’s how we met Michelle Kakade. She was born Michelle Rocque in Bhopal, year 1968. Her grandparents were British. Michelle’s father worked in the merchant navy. They were five children in all – she has an older sister, two younger sisters and a brother. She was the middle child. For seven years, from third standard to the tenth, the siblings studied in Nainital, Uttarakhand. “ From a very young age, we were pretty independent,’’ she said. After completing that stint at boarding school, she returned to Bhopal. She was there in the city, when the infamous gas tragedy struck. Post eleventh grade, she secured admission to a catering course in Mumbai but didn’t find herself comfortable in the big metro. So she moved to nearby Pune, where her sister was pursuing an MBA; Michelle joined St Mira’s College to study humanities. After completing her twelfth, she studied English literature. Through school and college, she was into sports but not in the manner, where one pursues it diligently. Her participation in sports had much to do with sports and games being mandatory in school. “ It wasn’t because I had any special calling in anything,’’ she said. She was good at the throws – like discus. But there was no running. She got married early, at age 20; children and family life followed, equally early. Her husband, Anil Kakade, runs a successful construction business in Pune. 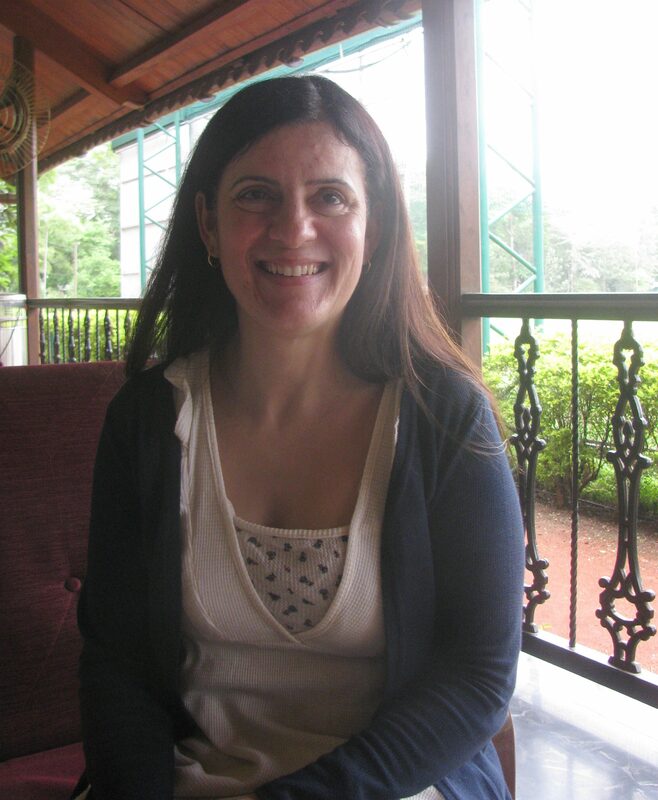 A couple of months after that first meeting near the Gateway of India, it was at Poona Club that we sat down for a conversation with Michelle. Post marriage and well into family life and membership at Poona Club, she began frequenting the club’s gym. The club had a ritual every Republic Day (January 26). It hosted a run featuring 26 loops of the adjacent ground. The trainer put her name down for it and as it turned out, she emerged first in the run. “ More important, I liked the experience,’’ she said. Michelle also mentioned something else, something we have since heard some extreme runners articulate and suspect, remains unarticulated in many others. “ I get bored very fast,’’ she said. According to her, she tried a lot of things but very few interests sustained. In running, her interest hasn’t diminished. “ After that first run, I began to get more and more involved,’’ she said. Those were early days for running in Pune, particularly with regard to women in running. The city was home to the Pune International Marathon, one of India’s oldest marathons. When she decided to participate in its half marathon segment and was training for it, there were few women running on Pune’s roads. At the event itself, women runners in the discipline she chose were four or five of which, two or three were foreign runners. Michelle finished her first half marathon in 2 hours 15 minutes. There was no timing chip then and the certificate issued at run’s end was a certificate of completion. When she pointed out that the slots meant to show timing were vacant, she was told to fill it herself. “ As time went by, my timing improved. I now do a half marathon in under two hours,’’ she said. The event whetted her appetite. 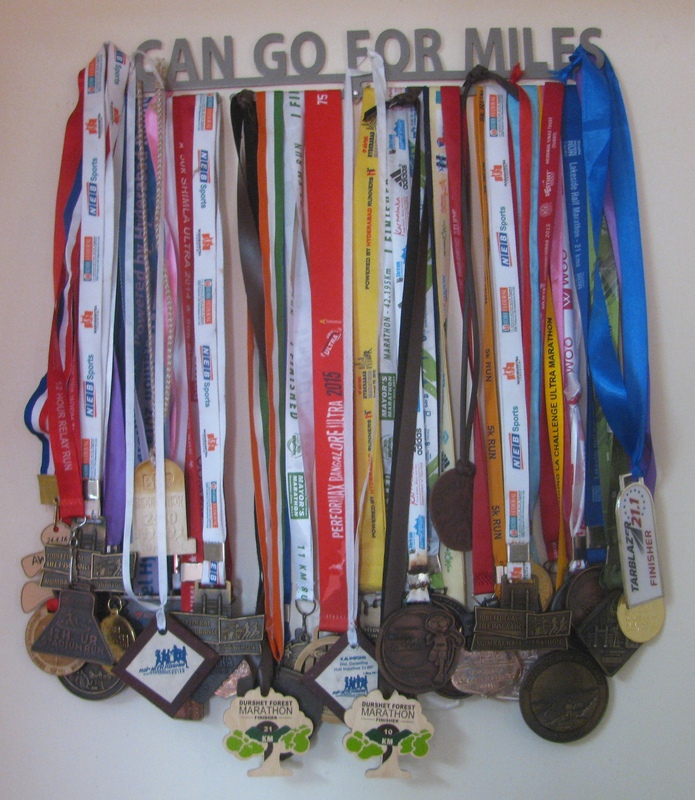 A few more half marathons done, she set her eyes on the Standard Chartered Mumbai Marathon (SCMM). One reason for this shift to Mumbai was that in Pune, the full marathon was considered a male preserve with very few women participating. 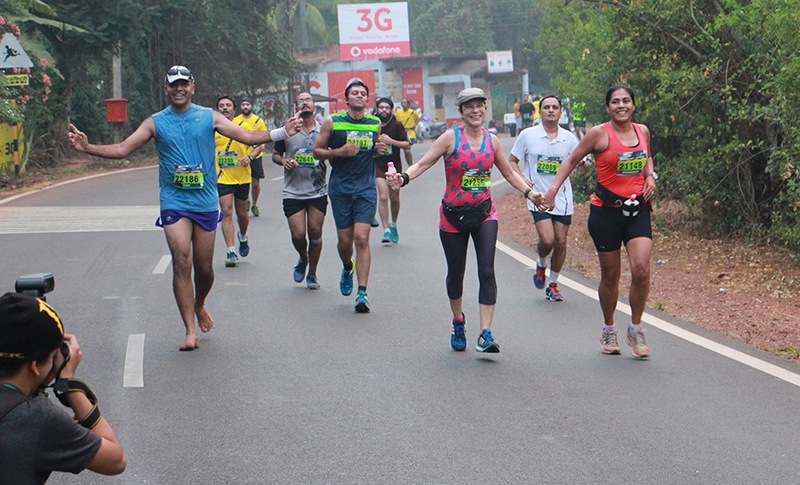 She did three full marathons in Mumbai; according to her, on the average she runs a full marathon in around five hours. During one of those SCMM editions, in the holding area for runners, she met a lady from Germany who was preparing to run with a backpack. As the two got talking, Michelle learnt that the German runner was in training for the Marathon Des Sables (MDS), which takes place in the Sahara desert. With Germany cold in January, the lady had elected to run in Mumbai. “ I was blown away. This sounded very interesting,’’ Michelle said. On return to Pune, she wasted no time browsing the Internet for more information on MDS. Although the event seemed challenging, what encouraged Michelle and hinted at the possibility of her doing it, was news doing the rounds (eventually it was denied) of a 51 year old-Madonna (the singer) deciding to run the 2010 edition. However, the trigger to participate came from an unfortunate, unexpected incident. At that time, the president of Poona Club was Manoj Malkani, who was a friend and relative. A play was due to be put up at the club and a discussion was on about it. “ He got up to leave and a while later, in the car park of the club; he suffered a sudden heart attack and died. That incident was reason enough to introspect. I asked myself – if something like that was to happen to me, what is the one thing that would define Michelle Kakade? I didn’t have an answer. We tend to procrastinate about a lot of things in life, we just keep delaying,’’ Michelle said. Manoj Malkani passed away in August 2009. In September 2009, Michelle signed up for the April 2010 edition of MDS. 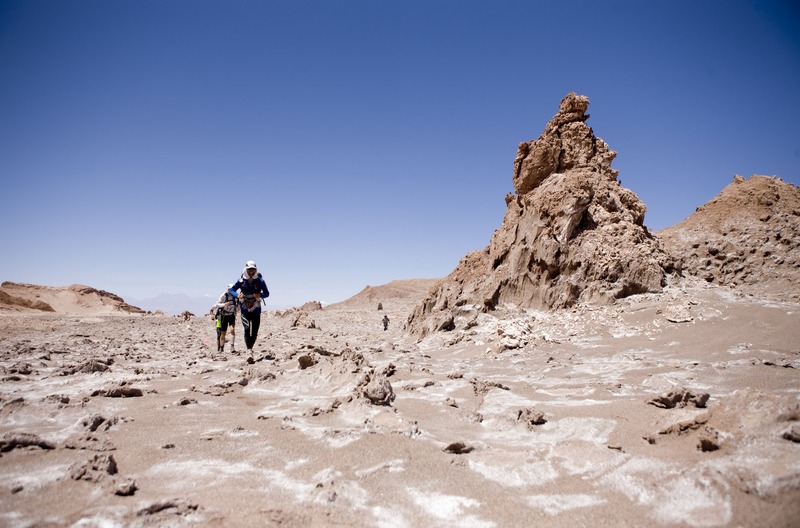 The Marathon Des Sables is a multi-day stage race – six stages over seven days. Altogether the distance entailed exceeds 250km and includes one long stage of over 80km. Given its location in the Sahara desert, daytime temperatures can be very high. Michelle’s training for MDS was very sketchy. In Pune, she approached the Army Sports Institute for help. But she was told that they train only army personnel. “ Sometimes ignorance is bliss. When you don’t know what you are getting into, everything seems rosy,’’ Michelle said. She trained at the Poona Club. Taking a leaf from the German lady she met at SCMM, she stuffed a backpack, put it on and ran with it. “ It was also a case of not knowing oneself. I was unprepared because I was unaware of what I can do,’’ she said. Reporting for the MDS in North West Africa, she discovered that she had got her equipment wrong. “ My equipment; food, backpack – everything was wrong. But you have to make the best of a bad situation. The atmosphere was super charged. The euphoria carries you on,’’ she said. During the race Michelle was bothered a lot by her inappropriate backpack. Then, she was hit by diarrhoea and a bunch of painful blisters on her feet. After the race’s long stage, she passed out. “ There were moments when I thought of giving up,’’ she said. But the people around were supportive. The MDS, like many ultramarathons, carries no prize money. That alters the competitive spirit and the company you find at the race. Further, there was something about an ultramarathon that addressed one of the problems Michelle had spoken of – the tendency to get easily bored. Unlike a typical road race, an ultramarathon – road or trail – is so long and pushing runner to his / her limits that you course through a variety of situations and experiences. “ You don’t know what is in store for you. I can’t keep doing the same thing over and over again. The newness appeals to me,’’ Michelle said. She completed the 2010 MDS. As at SCMM earlier, MDS introduced her to a potential next project. She saw a runner who was wearing gaiters with `Four Deserts’ printed on it. As she found out, it denoted the driest, coldest, windiest and hottest deserts; and there was a race – 4 Deserts Race – embracing all four attributes. According to Wikipedia, the 4 Deserts Race was recognized as the world’s leading endurance footrace by Time magazine in 2009 and 2010. At the time Michelle heard about it, the race entailed running in Chile’s Atacama Desert (driest), China’s Gobi Desert (windiest), the Sahara (hottest) and Antarctica (coldest). There is a three month-gap between each race. At each of these locations you have to run 250km. The run in Antarctica is by invitation; to become eligible for it you have to run in at least two of the other deserts. If you do all four you become part of the 4 Deserts Club. Back from MDS, Michelle was immediately into planning the four deserts trip. To start with, she signed up for the Atacama race. Eventually she did all four. She ran three of the races in 2011; the Antarctica leg which is dependent on the availability of a window, she completed it in November 2012. However, after the Antarctica race she was hit by a case of severe shin splints and plantar fasciitis. Given she was not resting adequately, the condition worsened till she could do nothing and was forced to take a whole year off in 2014. At its end, getting back to running was like a start all over again, albeit a quicker process. She did a trial run from Pune to Mumbai in July 2015. During this run she did three days of more than 50km each. It was a valuable input to decide what would be the optimum distance to run daily on the Golden Quadrilateral, such that a backlog does not pile up. “ Backlog in this type of extended runs can be a killer,’’ she said. She decided on 35km as optimum daily distance to run. It increased cost but appeared safe and sustainable. She also engaged Raj Vadgama as personal trainer. “ Raj’s previous experience was very vital. From him, we got to know relevant details for running everyday on India’s roads,’’ she said. Michelle had earlier secured a place in the Limca Book of Records for running on a treadmill. 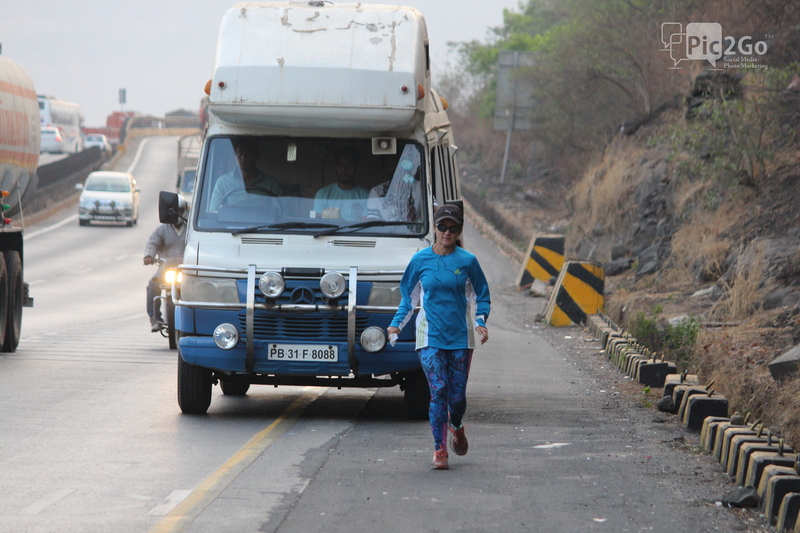 For the Golden Quadrilateral run, she decided to approach the Guinness Book of Records. 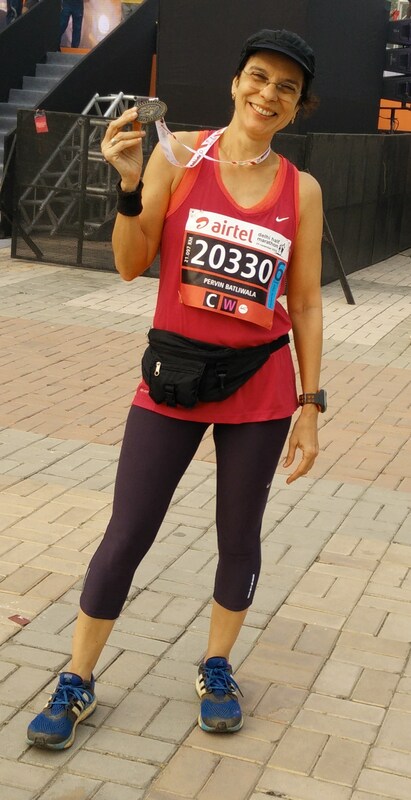 Michelle commenced the run on October 21, 2015, from Mumbai’s Gateway of India. Typically she ran seven days and then rested on the eighth. The longest stretch she did without such rest was 12 days. Her days on the road began usually at 3.30-4 AM. She would run for two to three hours and then take a break for breakfast. In that period, she would have covered a little over 20km. Then she ran the balance of a day’s planned mileage. The maximum mileage she ran on a day was 42.5km. As the run progressed, she was treated to a range of response from the regions she was passing through. According to her, she found support from fellow runners almost every day in Maharashtra. In Karnataka, she found support in Bengaluru and Hubli. There wasn’t much support in Chennai but Kolkata, provided “ very good response.’’ There was little support on the stretch between Kolkata and Chennai. There was little support for her in North India. However as a woman running on the road, Michelle had this to say, “ in the entire six months, I had no instance of anyone infringing on my personal space.’’ Michelle ran the Golden Quadrilateral from October 21, 2015 to May 1, 2016. That day when we met her at Mumbai’s Gateway of India, at the end of the run, she had covered 5968.4km. It was now noon and Poona Club was beginning to gets its lunch time rush of members. Some of them said hello to Michelle. The folks at Guinness Book have ratified her record setting run. Her record is for “ the fastest time to travel the Indian Golden Quadrilateral on foot (female).’’ She had no new projects in running planned. It was one of those in between periods to take stock of what all happened. Michelle concedes she has been fortunate. She was able to pull off overseas runs and big projects because she had resources. From what we understood, the bulk of the cost for running the Golden Quadrilateral was borne by Michelle and her family. Despite her position and connections in life, she too had difficulty finding sponsors. Every now and then, somebody writes to her about running the Golden Quadrilateral or some other pet project, something big and life-changing. Too many dreams lay unfulfilled for want of resources. Her simple, straightforward question is – why burn your fingers attempting projects beyond your pocket? Why run the Golden Quadrilateral and lose what money you have? “ Till you get a sponsor don’t attempt it,’’ she said. My hotel room has a fan and I can’t believe it. The temperature didn’t warrant using it. Equally, if I turned it on I wouldn’t be very cold. The fan harked of early entrant whose time will come. As in the Bob Dylan song: the times, they are a changing. The food served at Hotel Siachen, amazed for the variety of vegetables in it. The hotel was in Diskit, Nubra Valley, Ladakh. “ The vegetables used were grown here,’’ the employee standing behind the buffet table informed. He said that weather patterns had been changing slowly in Ladakh. Winters aren’t as severely cold as before and in land famous for being high altitude cold desert, rain was getting through. That has its problems. The powdery soil of Ladakh’s mountains dislodges quickly with water. Rain makes people nervous. On the other hand, the rising warmth and occasional wetness has meant improved scope for home-grown vegetables on Siachen’s table. Next day, around noon, a very light rain manifested briefly. The forecast, as available from a couple of days ago, wasn’t good. August 11 evening; there is a mass of dark grey gathering in the skies behind Diskit. A cold wind blew. 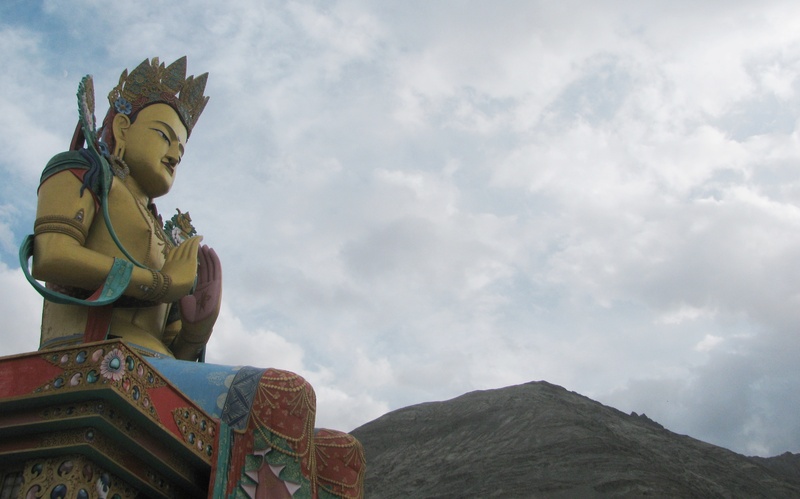 The massive Maitreya Buddha statue on a hill near the Diskit monastery faced the approaching grey in peaceful meditation. It rained. Dr Rajat Chauhan looked past the statue to the clearer skies it guarded. Hope is a good word. It was still raining when the convoy of cars left Diskit. Ladakh’s roads are a study of curves and straight lines; curves on mountainsides, straight lines on vast, open flat land. The starting line was on a straight road below Diskit, close to the flood plains of the Shyok River. The vehicles bearing runners parked here, one behind the other. A small hamlet of headlamps took shape. The countdown had begun. In 1992, director Ridley Scott made a movie: 1492: Conquest of Paradise. Garnering mixed reviews, the movie wasn’t commercially successful. Its theme music ` Conquest of Paradise,’ by the Greek composer Vangelis, however became popular, including as the preferred music at the start of the Ultra Trail du Mont-Blanc (UTMB) in Europe. A powerful, evocative musical composition, it played on the mobile phone of Dalibor, part of Jovica Spajic’s support team. Rain and cold notwithstanding, Jovica looked ready for action. 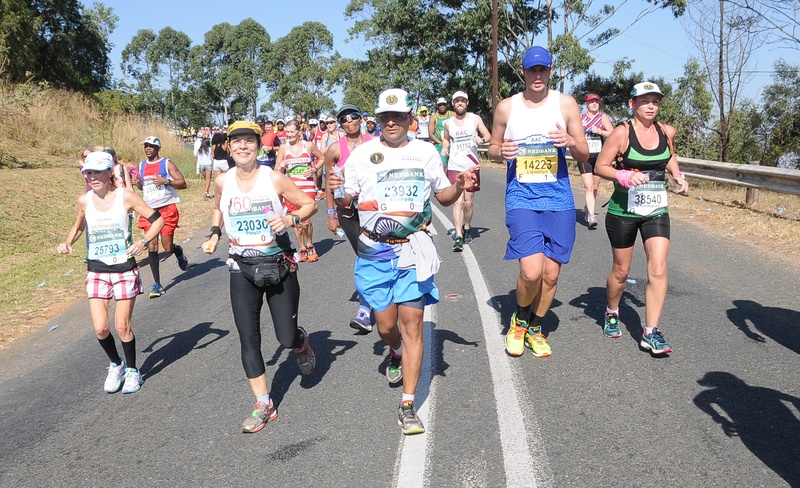 By now the other runners too had got out from their vehicles – Grant Maughan, Mark Steven Woolley, Alexander Holzinger-Elias, Dariusz Strychalski, Nahila Hernandes, Dunya Elias, the team from the Indian Navy, Saachi Soni, Rahul Shukla, Ramanand Chaurasia and Kieren D’Souza. August 11, 8 PM, they set off. Minutes into the 2016 edition of La Ultra-The High, they tackled the first problem: a portion of the road submerged in ice cold water, thanks to an overflowing stream. That done, one by one, they drifted into the inky blackness of Nubra’s night, a series of headlamps making steady progress on the road. Kieren led the group. There was a ring of expectation around Kieren. He was a young Indian ultramarathon runner born in Nagpur, brought up there and in Bengaluru, now living in Faridabad. His well-wishers presented him as someone who had grasped the nuances of the sport. In 2014, he had participated in the 111 km race of La Ultra and failed to complete it; according to the official website of the event, his race ended at kilometer-48, a Did Not Finish (DNF). Two years later, he had elected to return with considerable training at altitude done. Besides races in India, he had been to UTMB. 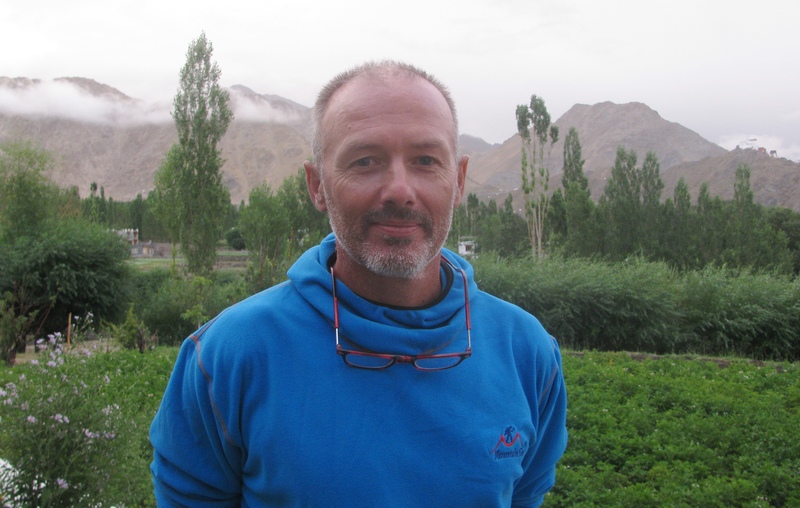 That night on the road leading to Khardung La, Kieren showed no lack of confidence. 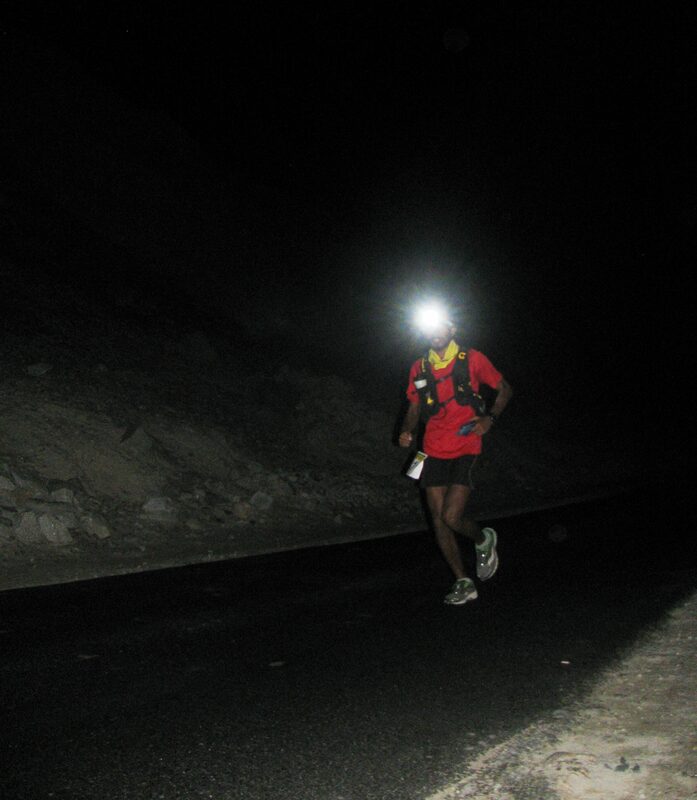 He ate up the miles, opened up a long lead and chugged steadily on to Khardung La. La Ultra-The High is an ultramarathon composed of three separate races on the same course – 111 km, 222 km and 333 km. As the distance increases, so do difficulties. The average elevation of Ladakh is around 10,000 ft. The race is held on the road. Its highest elevations are mountain passes with roads through them. In the 111 km segment, you get Khardung La (17,582 ft), in the 222 km segment, you get Khardung La and Wari La (17,200 ft), in the 333 km segment you get both the earlier mentioned passes and Tanglang La (17,480 ft). Running this course, a runner will experience temperatures varying from 40 degrees centigrade to minus 10 degrees centigrade. Depending on altitude, atmospheric pressure will reduce to 50 per cent of what it is at sea level. This affects oxygen intake. Add to it progressive fatigue and susceptibility to adversities brought on by the elements – that’s what makes La Ultra particularly challenging. It currently ranks among the toughest ultramarathons in the world. It is also an expensive proposition given the mandatory acclimatization schedule. You have to be in Leh, days in advance. That makes it, a commitment. As some of the foreign athletes gathered to run the 333 km segment said, the race is little heard of in the global ultra-running circuit. Discerning runners are attracted by the fact that not everyone finishes it. Appreciated in this context, was how the organizers have preserved race parametres without diluting it to attract higher number of participants. Broadly speaking, this purity is a function of distance and cut off time. The whole race of 333 km is run at one go with runners moving through the night. They have to cope with sleep deprivation, planning their rest as they wish. However within this large single stage, there are cut offs (time limits within which sub sections must be run) to respect. This introduces a sense of constant momentum. Rest is typically eyes shut for some time. The whole course is covered in a mix of running and power-walking, rarely dipping below that in pace. Seventeen runners reported for the 2016 edition, twelve of them (two foreigners, rest Indians) for the 111 km race. Very important for a race of this sort is the medical team. The Race Director (indeed its founder) is Dr Rajat Chauhan, who is a leading specialist in sports medicine. The 2016 medical team was composed of Tim Berrow and Nick Dillon, experienced in dealing with medical emergencies in remote locations. As they explained, a difference when working with an ultramarathon wherein athletes push their limits is, gauging how far a runner can push his / her limits safely and monitoring that appropriately. You don’t terminate his / her race without providing room for stretch. At a medical briefing for volunteers and support crew, Tim and Nick put their approach in perspective. While altitude is the most obvious challenge in La Ultra, the solution for altitude related complications like High Altitude Pulmonary Edema (HAPE) and High Altitude Cerebral Edema (HACE) – is as obvious. The best treatment for altitude issues is descent. With the race being held on the road and vehicles present for support, treatment was available at hand – get the patient down as quickly as possible. The medics were more worried about heat related complications – the consequences of losing heat or heating up. La Ultra debuted in 2010 as a 222 km race. Given its emphasis on adequate, prior ultra-running experience, it was partial to foreigners. Indians who attempted it, struggled to get past the race’s early stages. For a country getting used to the ultramarathon, 222 km at altitude with cut-off time alongside, was probably too big a first step. At the same time, some of the foreign runners who completed 222 km felt that a return to attempt the same distance wasn’t engaging. They sought greater challenge. That’s how the 111 km sub-race and the extension of overall length to 333 km happened. 2016 was special for the 111 km segment. The Indian Navy dispatched a team of six runners for the 111 km race. Their team leader Captain Rajesh Wadhwa had been podium finisher (along with Ramanand Chaurasia) at an ultramarathon in Garhwal, which serves as qualifier for La Ultra’s 111 km category. 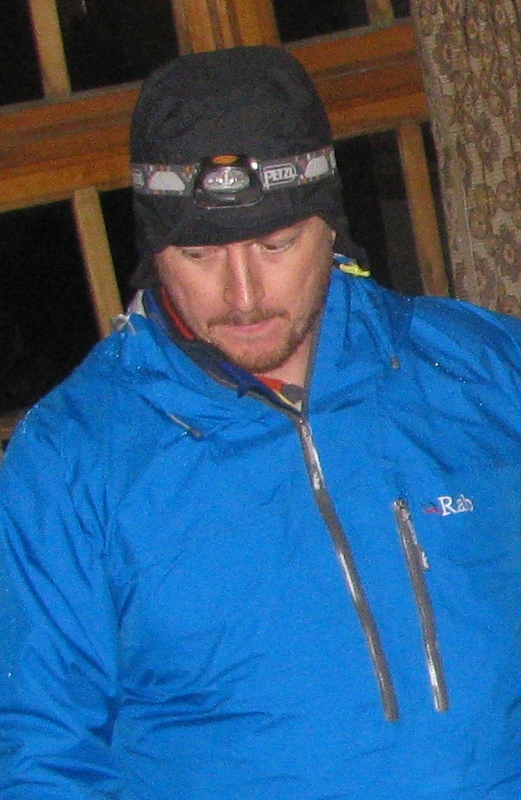 When he sought permission to participate in La Ultra, the navy, noticing the uniqueness of the race at altitude, recommended a team. If you want to know how fast runners can be – even in the hills – all you need to do is, eliminate traffic. Night does that for you. With nothing else around moving for distraction, running’s pace shines forth. An ultramarathon is slow. But even that seems a determined, consistent lapping up of distance when ultra-runners are the only ones moving in the frame. Past midnight, the slopes of Khardung La were pitch-dark. Kieren’s headlamp would bob in the distance and then slowly, unfailingly wind up the road’s curves to where one stood. As I prepared to ask “ all okay?’’ he quipped, “ are you okay?’’ On the road, the first half of the string of runners included Kieren, the 333 km-pack, some of the navy runners, Rahul and Ramanand and Dariusz (Darek) Strychalski of Poland. Darek had enrolled for the 222km segment. He runs mainly with one side of his body; the other side having been paralysed in an accident in childhood. The mishap affected his vision too. Recovering, he lived a lonely life. Running was accidental and testing. He used to run very early in the morning to avoid being seen as his gait was awkward; one leg and side of the body does most of the work, the other supports as best as it can. Initially people looked at him like an oddity. He persisted. Slowly he regained the company of people. After two years of running, he ran his first marathon. His best timing yet in the full marathon was 3:07. He also ran the Badwater Ultramarathon. “ In Poland he is called the Polish Forrest Gump,’’ Anna, Darek’s friend said. Darek, who spoke no English, had been to La Ultra before. In 2015, attempting 222 km, he had to pull out at kilometer-35. That time he had been unable to continue his run because of a leg injury. 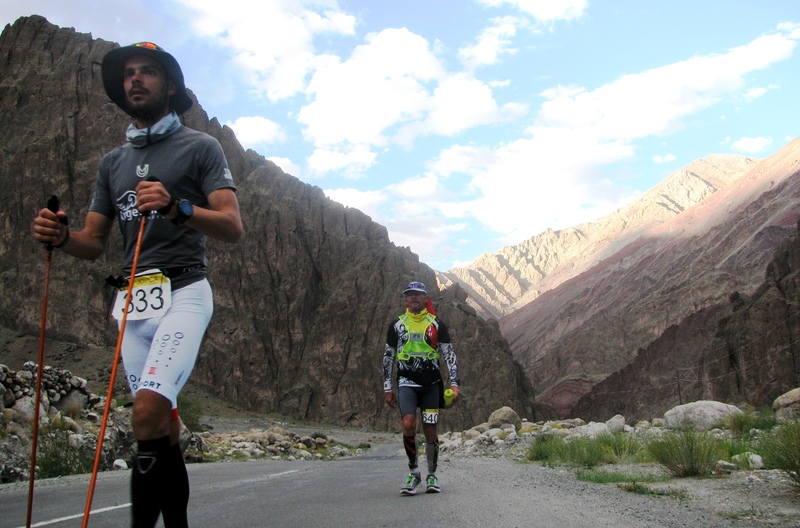 In Leh, in the run up to the 2016 edition, he had experienced return of the old leg injury. Running steep uphill sections challenged the man who counted on one good leg to do the bulk of the work. Darek never let the strain show. His face was always calm. For the medics and the Race Director, the 111 km segment is the busiest section of the route as the number of runners is more and it includes the less experienced. At the first cut-off, a little over 20 km from the start, two runners missed the stage cut off time and had to withdraw. Punctuating the ascent and descent on Khardung La are South Pullu and North Pullu. They are check posts, both at approximately 15,500 ft. On the ascent from the Nubra side, you hit North Pullu first. The medics gave everyone a check-up here. Two more runners retired from the race at North Pullu as they failed to reach on time. Darek arrived at North Pullu before the cut off time. He was very cold and having low oxygen saturation. “ His lungs was clear, his pace had slowed down. He was okay but feeling very, very cold,’’ Nick Dillon, one half of the medic team, said. Darek was warmed up. He was the last one to leave North Pullu for Khardung La. Nick followed in his vehicle; he kept reassessing the runner’s condition. Not just Darek’s but as he put it – into a race, the back of the pack is where the ones needing help are. Between North Pullu and Khardung La. Nick Dillon grew worried about Darek. The runner’s lungs were clear, his mental clarity was good. His pace was very slow. At one point his oxygen saturation was 55 while that of everyone else in the medic vehicle was around 70 (these figures must be read in the context of altitude). What made Darek’s diagnosis difficult is that his medical history featuring partial paralysis, created a case for weak circulation. Even looking for ataxia (loss of balance, it is a symptom of altitude sickness) was difficult because Darek’s natural gait had a wobble to it. He was allowed to proceed because he seemed neurologically sound. But when the runner’s pulse slowed down and ataxia became strongly suspect, Nick decided to consult Dr Chauhan, the Race Director. The latter spoke to Darek who resolved to press on. About 50 metres from the Race Director’s vehicle, with Nick and Anna present, Darek stumbled pronouncedly. It was curtains for his second attempt at La Ultra. The Race Director pulled him off the race and Nick administered oxygen. “ It was a combination of factors and several things building up over time that resulted in this intervention,’’ Nick said. It was also a text book case of what the medics had promised – that they would assess, provide room for stretch, keep monitoring and if required, pull the runner out. Darek bore it stoically. He and Anna returned to the race to encourage and applaud fellow runners. On the map of Europe, Slovakia lay to the south of Poland, south of Slovakia is Hungary and to Hungary’s south is Serbia. Straddling the junction of European and Asian cultural influences, East Europe has a tradition of being Europe’s powder keg; the world wars of the twentieth century were sparked by events in these parts. In the closing decades of that century, as the erstwhile Iron Curtain crumbled, the Yugoslav Wars broke out (Wikipedia describes them as conflicts spanning 1991-2001). Jovica Spajic was born in Priboj in Serbia in 1987. He grew up with his grandparents; he used to help his grandfather with work in the forest. “ These memories bring so much peace in me. I liked to talk about the future with my grandfather,’’ he said. His father worked in the police and following his basic education, Jovica attended secondary police school. Then he moved to Belgrade for “ real’’ police school to join the special-forces. For someone with that background, Jovica speaks passionately, emotionally. “ Till I turned 14 years old, we had war. That is too much for young people. Maybe it matured us with experience. You learnt to survive with little; a piece of bread and a glass of water. We enjoyed small things. Life was tough and beautiful at once,’’ he said. His grandparents died some years ago. “ There is a lot of empty space in my heart because of that,’’ he said. If there was a well-tuned running machine at the 2016 La Ultra, it had to be Jovica. A black belt in judo and jujitsu, he seemed energy reined in. He came to Leh with two close friends, Dalibor and Alex. Jovica met Dalibor much before his running career took off; at a “ small’’ run in Belgrade, “ a six hour-race for which I had arrived in walking shoes and jeans.’’ In the stipulated six hours, Jovica covered over 60 km. Dalibor encouraged him to take up running. “ That was the start of a voyage,’’ he said. Later, back in Belgrade after a mission in the mountains with the special-forces team, he chanced upon a magazine article on a race in the Sahara. He decided to go for it. He was the first Serbian to attempt the race and completed it in seventeenth position. On return, he and Dalibor formed a group called: Ultra-runners Serbia. “ It is like a community. There are people from age 15 to 55. It isn’t just about running; it is about life, friendship, progress. Each of us, have some talent, we express that in our community; we try to motivate others to find their strong point. There is nothing aggressive. We don’t judge anyone. That is not our purpose. The elder generation talks with sorrow and pessimism about world and war. We try to be different. We want to tell positive stories to the next generation and create in their head, space for forgiveness. We don’t blame anyone. We must put a full stop and move on; there is no use staying in the past,’’ Jovica said dipping into the many things ultra-running seemed, in his life, the first 14 years of it, affected by war. “ Ultra-running is like a river. It is like life, flowing along. Life is a synonym for ultra-running,’’ he said. 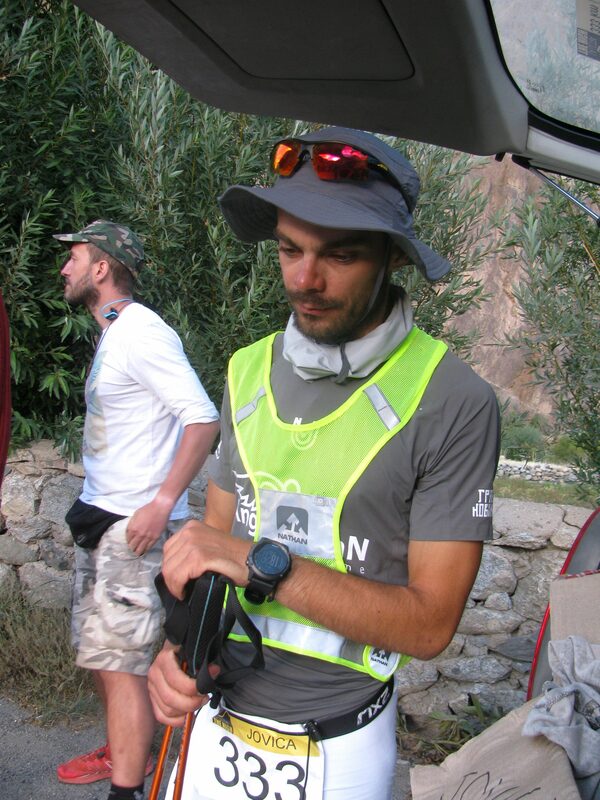 According to him, Serbia’s ultra-running community has the quality of an oasis. “ It is our space. We don’t make huge plans. We take small steps. In big space you can’t make a difference; in small space you can,’’ he said. Following the race in the Sahara, Jovica started to regularly participate in races and push his limits. He ran Italy’s longest road race, the ` Ultra Milano San Remo’ and the ` Race of Titans’ in the Italian Alps. In due course he became the national record holder in running for 24 hour-runs, 48 hours, 72 hours and six day-races. Then he entered the Guinness Book of World Records for the maximum number of sit-ups – 30,000 repetitions in 24 hours. In 2015, he was accepted to run the Badwater Ultramarathon in California’s Death Valley, one of the hottest places on Earth. Training for it in Serbia with its nice weather, was tough. Jovica trained with several jackets piled on to create a very hot environment. “ It was odd doing so in the centre of town,’’ he said. In Death Valley, he had just one day to acclimatize. “ I had no strategy or tactics, I ran with my heart,’’ he said. Jovica completed the iconic race in about 29 hours to secure eighth position overall, the highest place that year for a European. On the final climb to Mt Whitney Portal, he had the best split timing; all that growing up in the forest and hills of Serbia must have helped, he said. Among those Jovica met at Badwater was, Grant Maughan. “ When you say Badwater, you think of Grant and a few other runners. It is like his playground,’’ Jovica said. Fifteen to 20 miles into the run in Death Valley, Jovica saw Grant struggle with stomach issues. He asked Grant if he needed help. “ He just laughed and said: everything is okay mate; this is normal, this is ultra-running. That’s one thing about Grant – one moment he is like near dead, 15 minutes later, he is full of energy,’’ Jovica said. 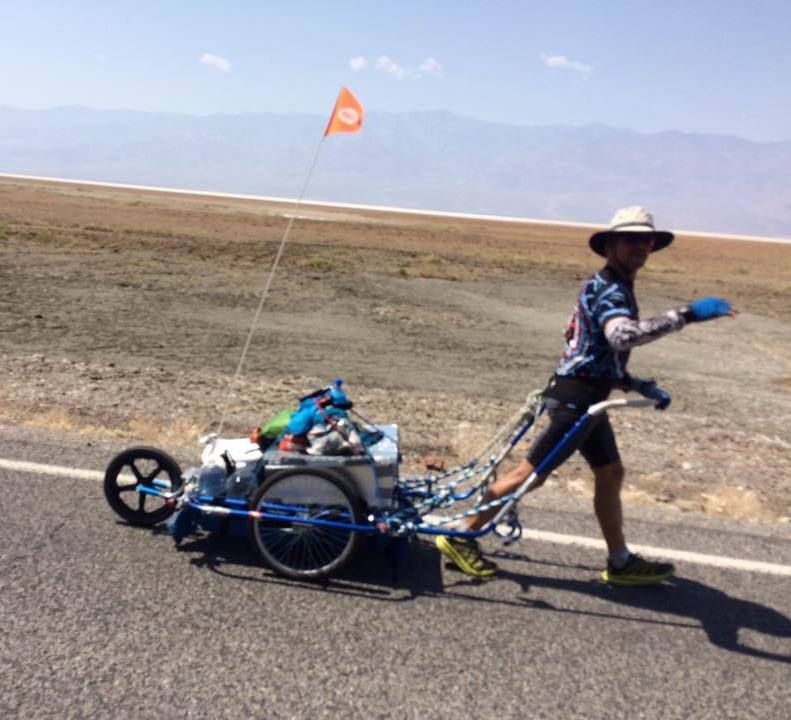 Grant, who has been a podium finisher at Badwater, ended the 2015 race in ninth position overall, just after Jovica. In conversations that followed, Jovica said he would like to run with Grant sometime. Grant seemed to keep a packed calendar. As of late August, his race history, available on the Internet, had been updated till February 2016 with the last event being the Alaskan winter classic, the Iditerod Trail Invitational. The list was an eclectic mix – many ultramarathons, a handful of marathons and a bunch of triathlons including Ironman; altogether 52 races, since 2011. In mid-July 2016, he successfully completed yet another edition of the Badwater Ultramarathon (finishing it in sixth position overall), by July end he was in Leh to acclimatize for the 333 km-La Ultra and race done in mid-August; he was expected within days thereafter in Colorado to run the Leadville Trail 100, a demanding 100 miler and among the world’s best known ultramarathons. “ I tend to recover well,’’ he said. Interestingly, Grant also said he gets bored very easily and needs activity. Further he is on a trip to stay healthy and get the most out of as little training as possible – the best option therefore, was to make running a lifestyle, hop from one race to another (one of the gathered runners pointed out that the flip side of this approach, is you may run some events sub-optimally). He found the people in ultra-running agreeable company. On the small lawns of Leh-Chen, on the eve of leaving for Diskit, he quipped how different the people around would be had it been a gathering of triathletes or marathon runners and not those into the ultramarathon. “ I find ultra-runners a quieter lot. They are an interesting bunch of people,’’ he said. 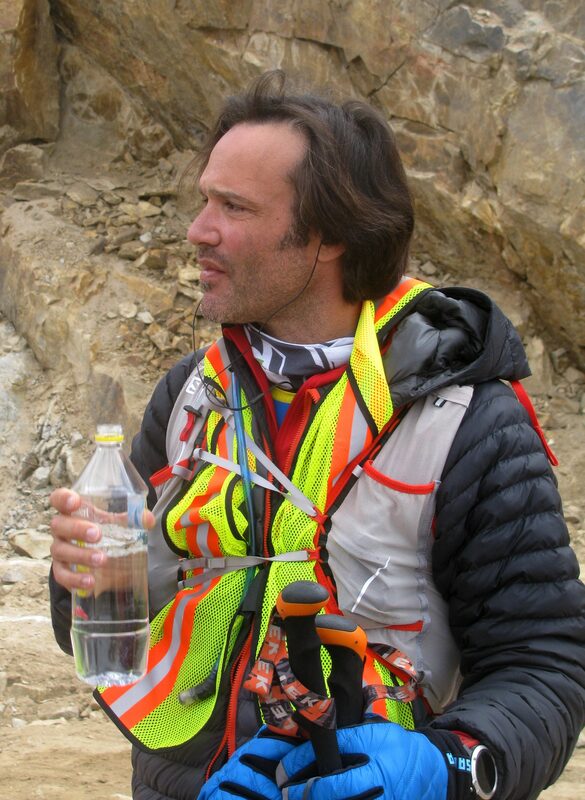 Besides running, seafaring and surfing, Grant is also a mountaineer who has climbed in North and South America. 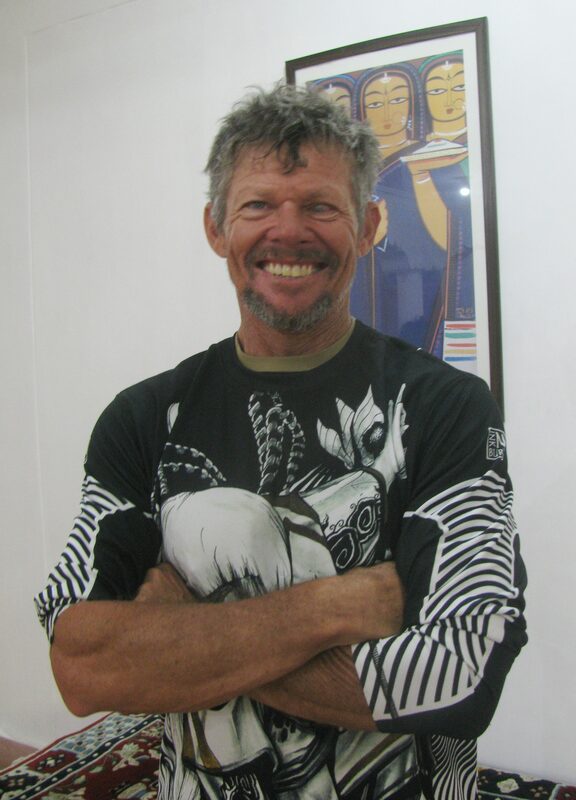 He heard of La Ultra from among others, Mark Woolley. He registered for the 2016 race. Reaching Leh – a town he had visited decades ago as a young traveler – he rested and then progressively set out to acclimatize for the race. One of the things he did was go up Stok Kangri, the peak climbed by many for a shot at 20,000 ft. He felt good. For race bib number, he had chosen `640,’ after his bike. Coincidentally, another runner the organizers reached out to was his young admirer from the 2015 edition of Badwater, Jovica Spajic. The opportunity the latter had dreamt of – to run with Grant – materialized. 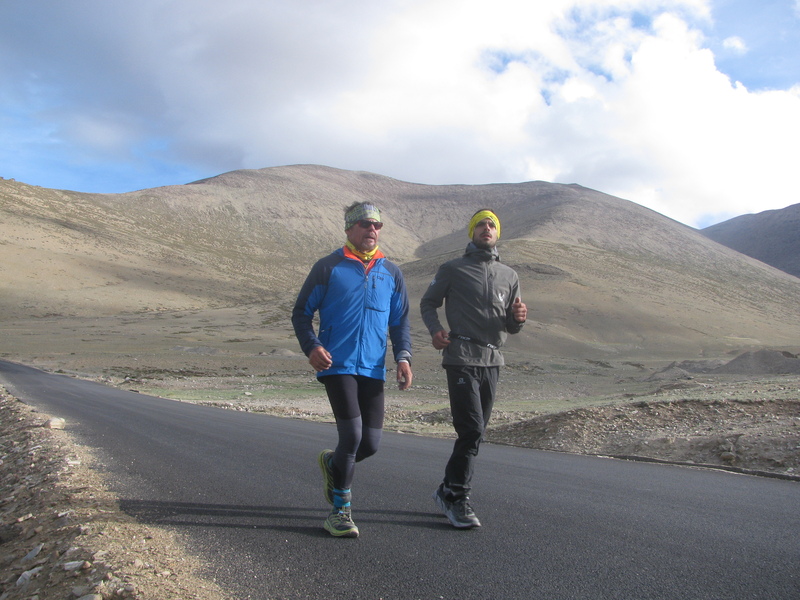 Reaching Leh, Jovica and his team, after spending some time in town, moved to Wari La, the pass that sits in the middle of the La Ultra course, to train. August 11, from the start of the race in Diskit, Jovica and Grant ran together. The night of August 11, medics Tim and Nick were at North Pullu when the runners reported for their check-in. It had rained along the way and with elevation, it had got quite cold. The small café at North Pullu was where the runners were assessed and warm drinks had. The personnel of the local ambulance service, was also present. Jovica’s entry into the café made heads turn. He resembles Virat Kohli, India’s cricket sensation. At North Pullu, the medics did a quick assessment of Grant. “ He was okay, there was nothing out of the ordinary,’’ Tim said. Past North Pullu, problems began. Tim was by now tracking and checking the first lot of runners for although they led the pack, that very fact meant they were ascending fast. Gaining altitude quickly can be dangerous. As the medics put it, broadly speaking the vanguard of the runners’ column where the strong racers are, runs the danger of coming up too fast; the middle is usually alright, the caboose is slow for valid reasons. So their eyes were on the front and the rear of the column. Up ahead, Tim posed simple questions to the runners. “ What I was looking for was: can they answer me in a full sentence, a quick inspection of how they were running or walking…such things,’’ he said. At roughly 15,800 ft Grant who had slowed down, said he was finding it hard to breathe. Tim had noticed changes. So he kept monitoring. 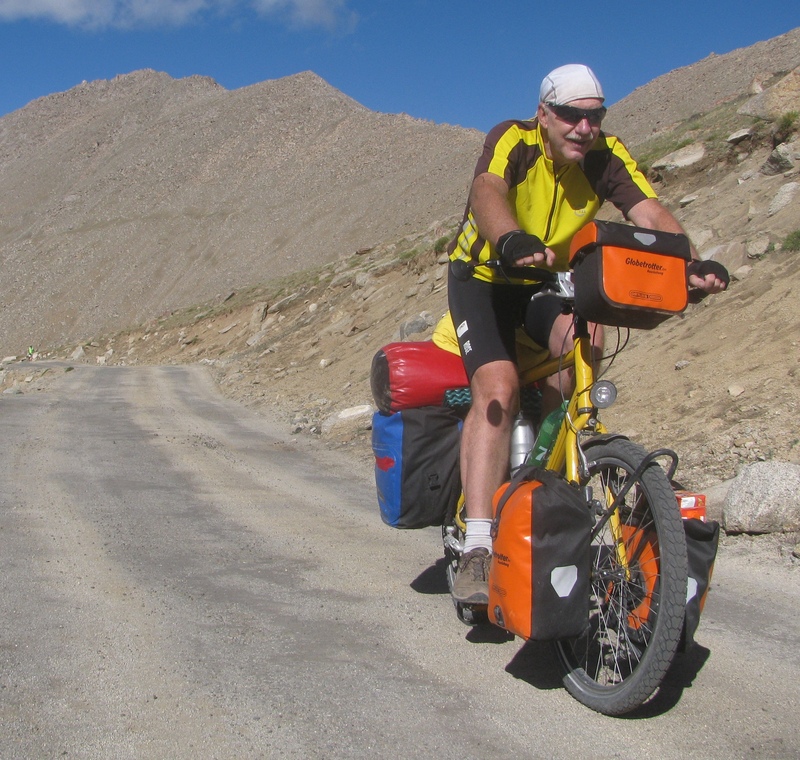 At Khardung La, he once again caught up with Grant. By now Grant’s difficulty in breathing was clear. “ It was obviously pulmonary edema. I didn’t have to get my stethoscope out, I could hear the crackling,’’ Tim said. The treatment for HAPE is descent to lower altitude and administering oxygen if needed. Inhaling bottled oxygen disqualifies a runner. So Tim walked with Grant till he descended to 15,800 ft on the other side. Tim’s vehicle followed with oxygen cylinder aboard. At 15,800 ft, Tim checked Grant once again. He seemed able to continue without medical assistance. “ This was a case of quick onset and quick recovery,’’ Tim said. 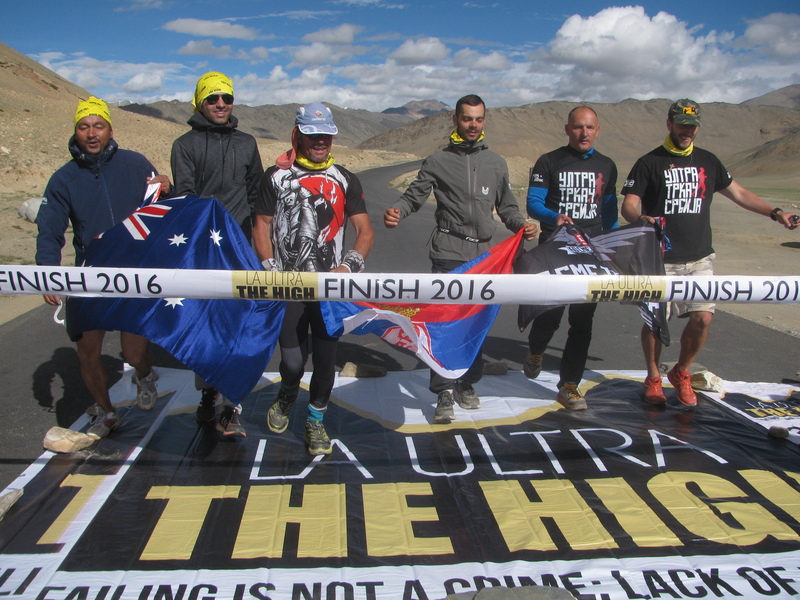 Something else – something very central to the 2016 edition of La Ultra – happened at Khardung La. When Grant struggled, Jovica waited. Grant told the young Serbian runner to continue and not waste time. Jovica not only waited for Grant’s medical assessment to be done but on the descent thereafter, he carried Grant’s small backpack till he felt sufficiently well. Abhinav Sharma, one of the members of Grant’s support crew, was waiting for the runners at South Pullu on the Leh-side of Khardung La. “ It was a humanizing instance,’’ he said of the moment Grant reached South Pullu, the effects of Khardung La visible on him. Towards noon, August 12, Kieren D’ Souza reached the finish line of the 111 km race. It was a new course record – 15:30 hours. The August 19, 2015 issue of Hindustan Times has the story of the previous course record; 17 hours and 57 minutes. It was set by Parwez Malik a scrap dealer from Dehradun in Uttarakhand. Parwez was the first Indian to complete the 111 km race of La Ultra. While Kieren placed first in the 111km segment in 2016, the second position was secured by Rahul Shukla, an engineer from Bhubaneshwar. Third was Hari Om of the Indian Navy. Kieren’s timing is considered to be very good for that distance, in a high altitude environment. “ Under similar conditions, the best we can expect internationally is just over 14 hours. However, we must appreciate that we got extremely lucky this year. We started off with poor weather conditions, which cleared very soon. Best conditions in the last seven years. Let’s not make too much of these timings as they can’t be compared from year to year for the earlier mentioned reasons,’’ Dr Chauhan said. In September, Kieren was scheduled to travel to Greece for Spartathlon. “ Give him 2-3 years, he will be right up there,’’ Dr Chauhan said. A remarkable story from the 111 km race would be that of Nahila Hernandez. Born in Azerbaijan and now a Mexican national, she is one of Latin America’s top female ultramarathon runners. Among other milestones in her career, she was the first woman to cross South America’s Atacama Desert. Nahila’s baggage arrived late in Leh upsetting her acclimatization plans. Then, a day before setting out for Diskit, she fell ill with food poisoning. Till the time of leaving for Diskit, she was under the care of the medics. Nahila had originally registered for La Ultra’s 222 km race. She switched to the shorter 111 km and essayed a wonderful run, surviving on just fluids. But what should interest amid all this is that the ones who immediately followed Kieren were those from the 333 km-pack; they had over 200 km more to go and yet their pace wasn’t terribly slow compared to Kieren’s. Mark Steven Woolley was seated nearby when I interviewed Grant. They were of the same age. At one point, Mark couldn’t help intervening, hearing Grant’s views on running – it was so similar to his own. Yet as the two runners explored that similarity further, disparities emerged. Grant said he is a loner. Mark wasn’t, indeed among the gathered foreign runners he was the one who mixed with others the most. Grant didn’t think much of competing; Mark admitted to occasionally drawing energy from it. Late evening, on August 12, several kilometres away from Leh, the headlights of our car picked up a runner, paced by a member of his support crew and proceeding diligently to Sakti. It was Mark. He was in many ways the real hero of La Ultra’s 2016 edition. 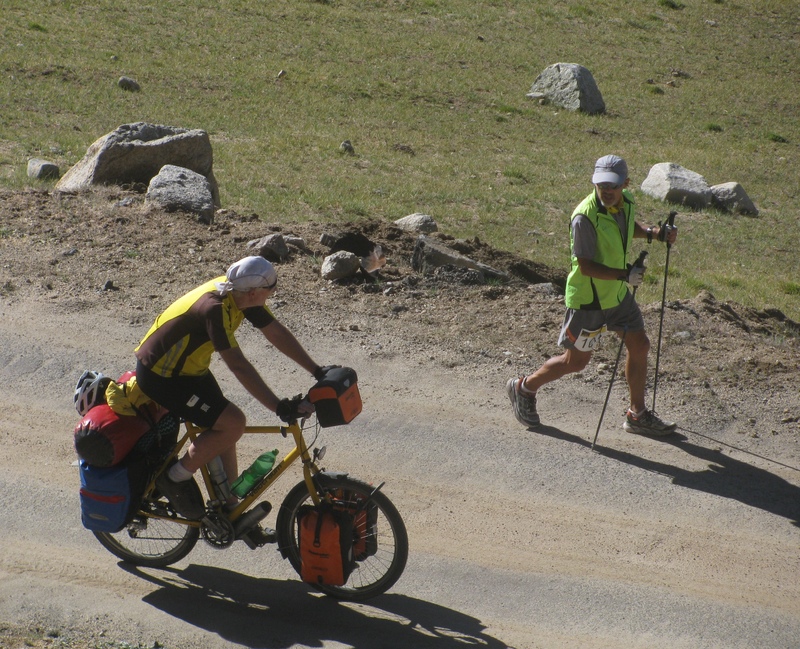 While people blaze their way to the finish line or complete strenuous races on their first attempt, Mark had been denied the satisfaction of completing the 333 km stretch twice before. 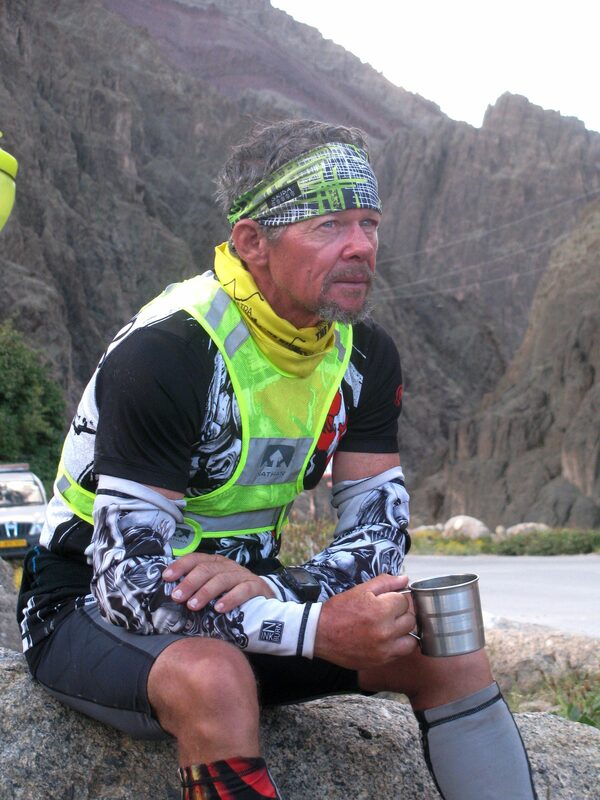 Mark is an accomplished ultra-runner with races like UTMB, Badwater and Spartathlon under his belt. He was also into martial arts. Mark is an Englishman, living and running in Spain. He is a school teacher; he teaches Physics. Elena, his wife who was part of his support crew for the first time on the 2016 edition of La Ultra, is a photographer. Mark had previously completed the 222km version of the race successfully. 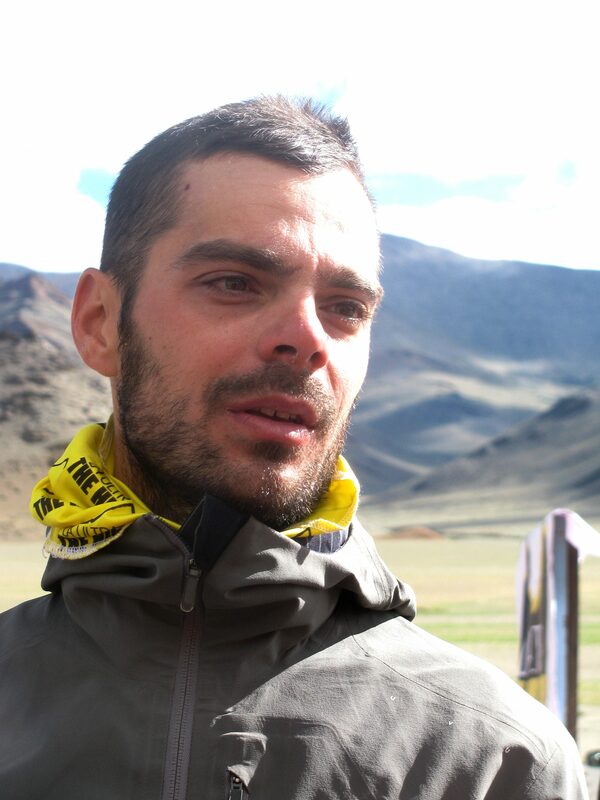 According to La Ultra lore, his disinterest in coming back was among reasons that spawned the longer 333 km race. A new race born, in 2014, Mark attempted it. That first time at La Ultra’s 333 km race, he overtook his nearest competitor and led, till at kilometer-317 – past Tanglang La – he collapsed. He went into shock. The descent from Tanglang La to Dibrung, in its early portion, is a mix of sharply contrasting ambiances. Depending on the time of day, just after the pass, you get a sunlit mountain face. The road then proceeds to a gully, takes a U-turn and straddles the opposite mountain face, which is in the shadow and hence cold. “ Up there, the big issue is high altitude but sometimes you have the more common problems like hypothermia and hypoglycemia. Mark was extremely low on energy and suddenly the temperature dipped because he was in the shadow region,’’ Dr Chauhan said of what triggered collapse and shock. That year was weird. Probably because 2014 was the inaugural year for La Ultra’s 333 km-challenge, of nine people running the distance, eight ended up DNF. Only one – Kim Rasmussen of Denmark – finished. Mark’s was the last of the DNFs, which had begun from kilometer-48. On the second occasion, in 2015, Mark ran up and over Khardung La in good time but then began worrying if he had done it too fast. He wondered whether such an approach to altitude would elicit a toll later in the race. Next day, when he experienced difficulty breathing, a rather convincing notion that he was unwell, took hold. With memory of previous collapse alive in mind, he lost much time insisting on being checked by the medics when the medics couldn’t find anything wrong. Eventually he finished the race 52 minutes after the cut off time for the whole course. 2016 was his third attempt. “ I like to finish what I started,’’ Mark had said ahead of the 2016 race. If there was any runner, everyone wanted to see finish the race successfully – it was Mark. You have to have a big heart to return three times for La Ultra’s 333 km-ordeal. I had asked him if three times on the same route may deny runner’s mind a sense of motivation. “ No, you start with an empty head. Every race is new. Besides this is the Himalaya,’’ Mark said. 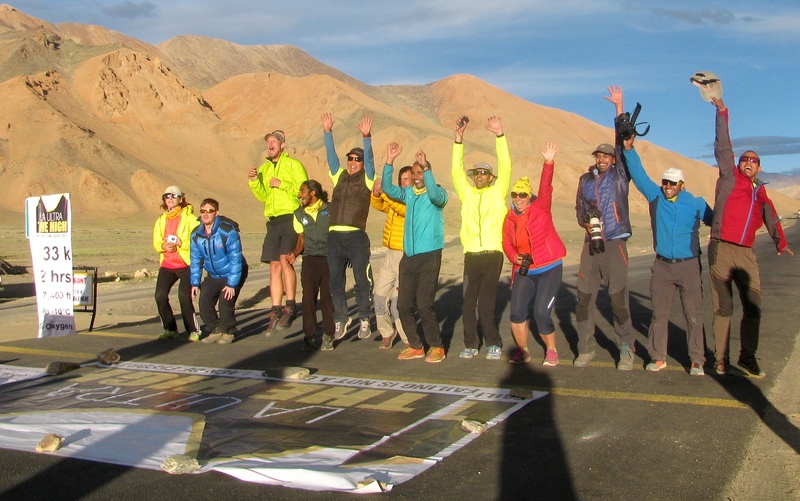 Morning of August 12, as they came off Khardung La and South Pullu, the 333 km-runners were free to halt at the Goba Guest House in Leh, which served as the race organizers’ base camp. Waiting for Mark there was Ryoichi Sato. In La Ultra circles, everyone spoke of the Japanese runner with respect. His visiting card offered a glimpse of the races he had run: among them were the Marathon Des Sables, Spartathlon, 24 Hour World Endurance Marathon, Annapurna 100, Mustang Mountain Trail Race and a clutch of races in Japan. In 2013, he required a pacemaker to be attached to his heart. Two months later, he completed La Ultra in its 222 km-avatar. “ I got to know of his pacemaker only after I reached Leh. That year’s medical director almost had a fit when she learnt of it. Sato has some crazy runs in some amazing times. The pacemaker wasn’t something that bothered me. I did tell him that he needed to listen to his body a bit more now and not be as reckless as he would have been a couple of years ago,’’ Dr Chauhan said. In 2014, Sato had attempted the 333 km-version of La Ultra along with Mark. “ Sato San’’ met Mark a little away from the guest house and ran a short distance with him. A while later, refreshed and rested, Mark left the guest house on the next leg of the race. That was hours ago. Now a blazing afternoon and much of an evening later, on the run up to Sakti, he seemed to have slowed down. Gone past Mark was Alexander (Alex) Holzinger-Elias, a German businessman based in Bahrain. Both Alex and his wife Dunya are into running. Alex, who has been a regular at The Comrades in South Africa, had completed the 111 km race of La Ultra in 2015. That year, he placed second, behind Parwez Malik. He had then taken a leap of faith and opted for the 333 km category in 2016, skipping progression through the intermediate 222 km option. Training was a problem. Bahrain is a hot place with neither mountains nor altitude. Alex opted to run long hours early in the morning and after work, besides making the best use of the treadmill and the stair-master. 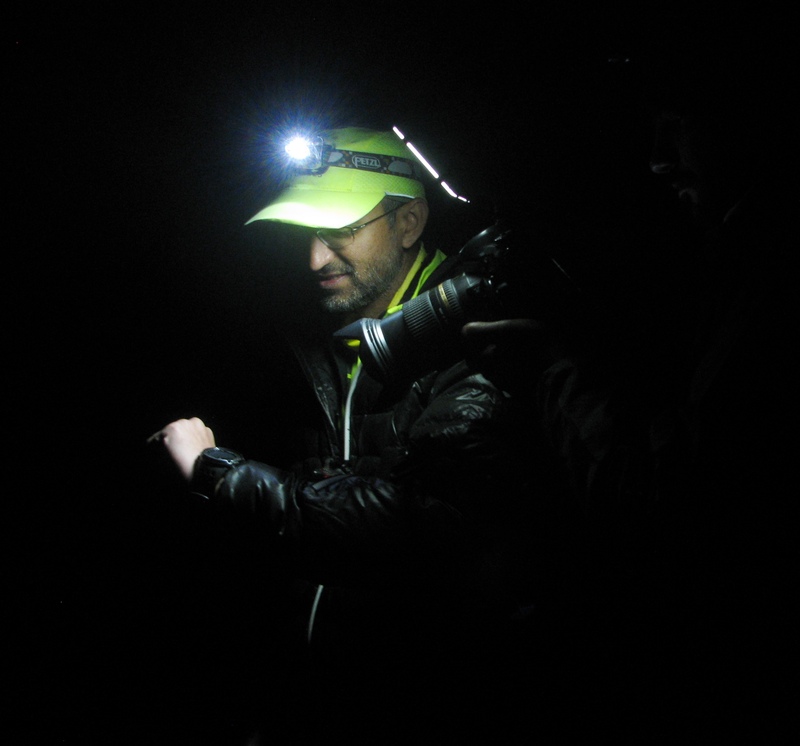 With Dunya as coach and manager, he also did a couple of races, which he thought may prepare him for La Ultra. Dunya’s bid at the 111 km race in 2016 ended quite early. She missed the North Pullu cut-off by 15 minutes. It was her second DNF; in 2015, she had stopped at kilometer-54. On August 12, she joined Alex’s crew. The least experienced of the 333 km-field, Alex kept a steady pace. He was the last of the four runners to reach Leh from Diskit, but by Karu, on the approach to Sakti, he had overtaken Mark. That was the pecking order August 12 evening; past Mark and his crew we came across Alex and his team. Ahead lay a small guest house – Solpon Camping & Home Stay – and beyond that, the 17,200 ft high-Wari La. Jovica and Grant had already reached Sakti and Solpon Camping & Home Stay. They rested for about an hour and 45 minutes. Late night, they set off for Wari La. Grant had to exercise caution. They were moving into high altitude. But Jovica was prepared for Wari La; this was where he had trained ahead of the race. The duo made brisk work of the pass. “ Their initial target was to reach the top of Wari La in about eight hours. They did so in six hours,’’ Dhanush K. N, who was part of Jovica’s support crew, said. Meanwhile very late at night, Alex and Mark too reached the guest house. Early morning as the sun revealed the beauty of Wari La and the view from there; all four runners were once again in the same region. Jovica and Grant were returning from the top while Alex and Mark were on their way up. Grant seemed fine after Wari La. Tim and Nick had an observation about the Jovica-Grant partnership. It worked to mutual benefit. The tough older runner had the drive of the younger one to draw motivation from; the younger one avoided the folly of heading too fast to altitude thanks to older runner around. It kept both in a stretched but mutually beneficial, relatively safe zone, aware of potential complications yet avoiding it. On the ascent to Wari La, Mark kept a slow, steady pace. He had chosen his crew carefully. Two of his crew members had been with him on his previous attempts; the third was Elena. “ For me, the most important thing in a crew is absence of conflict,’’ he said. He had that peace in his team; Mark’s was a happy, relaxed crew. It graced runner too. Mark was never beyond a “ hi’’ or a “ hello’’ on the road. Unlike cities, mountains are quiet. From a couple of bends above, I heard Mark say hello to Peter. The cyclist had slowly caught up with Mark. Peter was a police officer from Germany. His touring bicycle – a Velotraum – had pannier bags at the rear and up front. Loaded, it was heavy. “ I like my independence,’’ he told me. For a while, cyclist and runner seemed side by side, a moment Elena tried to capture on camera. Then the cyclist pulled ahead. On Wari La, Peter watched from the side as Mark reached the pass and turned back. The Wari La portion of the La Ultra course, is an up and down along the same road. As Mark left, we went looking for Jovica and Grant. Peter stayed on alone at the pass, enjoying his rest, before cycling on to Nubra. The road to Sakti and Wari La branches off from Karu on the Manali-Leh highway. Jovica and Grant were not at Karu; they had already gone past the junction. The sun was now blazing; it was hot, close to noon. We met them at Upshi, where the duo had decided to break for lunch. Jovica sat in his support vehicle. Grant sat on a chair in a dhaba (a roadside eatery), dressed in racing attire amid a bunch of tourists. Few looked up from their banter, food and selfies. The road from Upshi to Rumtse was testing. Not only was it the hottest part of day, there was vehicular traffic and in Ladakh’s still air, every molecule of smoke invades one’s nose and lungs. The runners proceeded carefully on this section. By all accounts, it was Grant who kept the steadier head on these hot, irritating sections of road with traffic. Exhaustion was slowly creeping in. Jovica paused to rest. Grant walked considerably ahead and decided to take rest himself. The support crew created a chamber within their vehicle for him to rest, windows masked with dark fabric. He chose to lie down on the road, legs up on the vehicle’s bumper. Before the start of the race, Grant had mentioned that he would like to keep his breaks for rest, not full-fledged but partial. Bare earth was perfect; neither here, nor there. Late at night, after a two hour-halt at the guest house in Rumtse, Grant and Jovica set off for the last high pass on the La Ultra course – Tanglang La. Probably because it is the highest and most publicized, when it comes to mountain passes in Ladakh, Khardung La is everything. Tourists in cars, bikers, cyclists – all want a photo or selfie there. When you run La Ultra from Diskit, things are different. 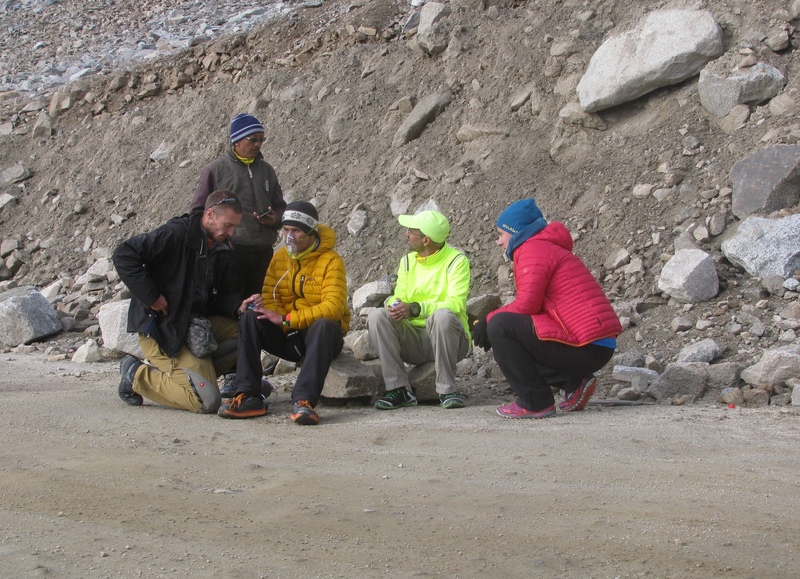 As the first test by altitude along the way, Khardung La takes its toll. But a seasoned runner is still fresh and able to tackle the challenge. Next night, it is a tired runner who reaches Wari La. However Wari La is overall gentle unless the weather plays truant. Picturesque and tucked away, it pulls the visitor in without a mission mode in the frame. August 13 night, as Jovica and Grant began the ascent to Tanglang La, they were not only tired from being on the road (almost continuously) for more than two days, they were sleep deprived and the approach to the pass was long and winding. The dimensions of these mountains hit you. The frustration is perhaps more at night, for in the darkness you can’t see the far bends or estimate how much more distance is left to reach your objective. Headlamps show you the way; they don’t show you the world. The unending climb took its toll on Jovica. He grew tad irritable. At one point he asked me if I knew exactly how many kilometres remained to the pass. He seemed searching for an answer better than the regular Indian reply of: it’s just over there. Although I had been on that road before as a traveler, I hadn’t observed it well enough to estimate distance, particularly at night. My response was disappointingly vague. Another time Jovica wondered if this combination of endless ascent and their tired selves was “ some sort of scientific experiment.’’ Grant assured in a composed voice that their problems stemmed from the night denying them perspective to gauge distance. Grant was however battling other worries – it was cold, exhaustion had been creeping in and Tanglang La was once again, a return to elevation. Not far from the pass, the medics came by checking on the duo. The runners asked if the medic’s car could be driven slowly so that they could follow its lights to the pass. That’s how Jovica and Grant reached Tanglang La. It was bitterly cold. The medics assessed Grant. “ Jovica was tired. But Grant was not engaging mentally. He wasn’t responding. We quickly took him to the vehicle and turned the heating on. His oxygen saturation was 65 while everyone else was at about 75. He was told that medically he is unfit to continue for the next ten minutes. He accepted that,’’ Nick said. During the ten minutes that followed, Grant had a litre of water and two chocolate bars. He was reassessed. His oxygen saturation was now around 85. His lungs were clear. He was allowed to continue the race. According to Nick it was a case of exposure exhaustion. Jovica once again waited till Grant was back on his feet. Tanglang La, appearing late in the race when runner is exhausted, has always been the real challenge in La Ultra. “ The pass is 309 km into the race. That’s a lot of running by any standards even if it is in the plains. Now add high altitude and extreme cold to it. This year’s medics pushed my extreme approach too. They are thorough professionals who appreciate what runners are doing and what it means to them. As a support team, they were the find of the event. We are still learning how the human body responds to endurance events in such extreme conditions,’’ Dr Chauhan said. The previous morning, Alex had reached Wari La before Mark. On the way down, Alex decided to rest some time at the guest house in Sakti. Mark didn’t. He regained his lead. But at Karu he rested and Alex went ahead. The latter, reaching Rumtse ahead of Mark elected to rest for about two hours. Mark reached Rumtse late but kept his rest short. Some hours after Jovica and Grant had crossed the finish line, it was Mark we met first on the Dibrung side of Tanglang La. Alex was still a bend or two below on the other side of the pass. At one point, as he walked down the sunlit face of Tanglang La, Mark said, “ my energy level is fine. My legs feel like blocks of concrete.’’ If you run your hand on the bone above Mark’s ankle, you can feel a line of screws beneath the skin. There’s a rod in there. On the knee of his other leg, to the side, is the scar of a surgery gone by. Both are joints that have seen much work. 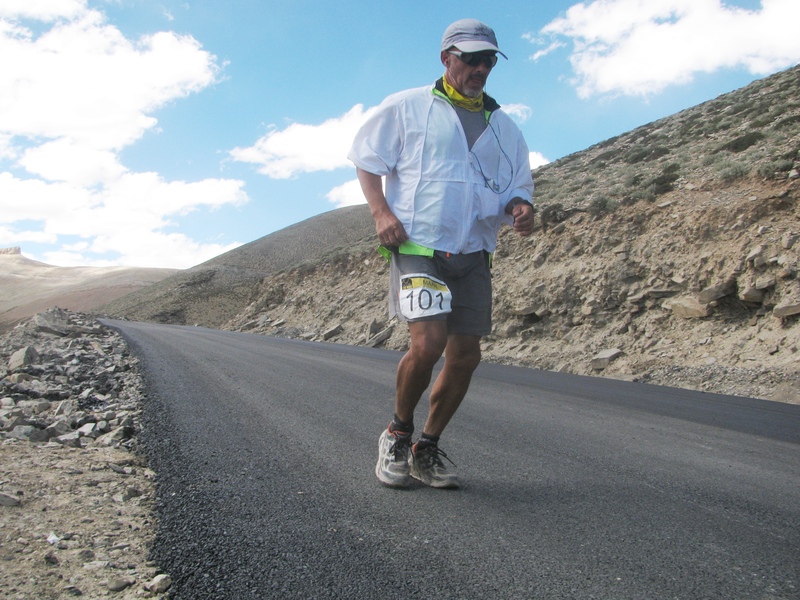 “ The ankle holds up but the knee tends to hurt,’’ he had said in Leh ahead of the race. Elena walked with him for a while on the home stretch to Dibrung. Just before the finish line he was joined by his whole team. That last bit, they walked together. 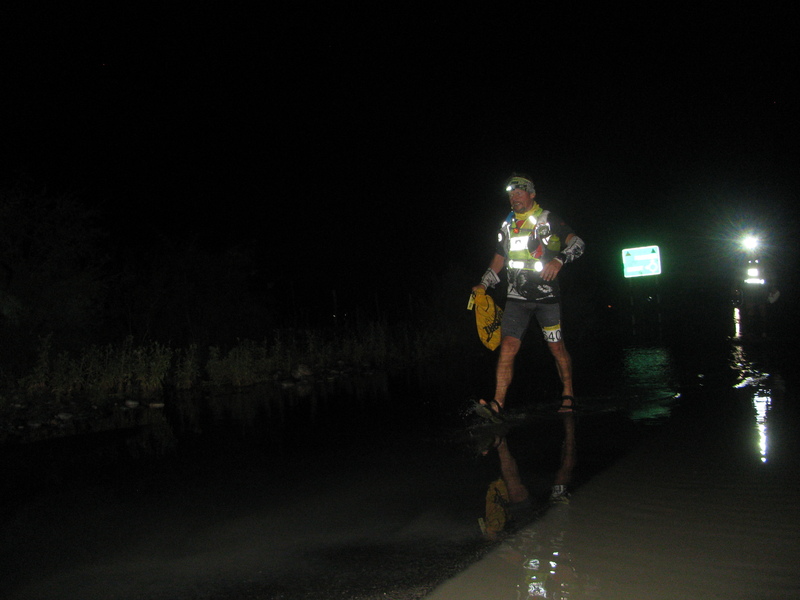 On his third attempt at the 333 km race of La Ultra, Mark Woolley succeeded, completing it in 68 hours and 57 minutes. The finish is significant. Mark, 52, has been working on a book on his life in running. He can now write the chapter on La Ultra. It was evening by the time Alexander Holzinger-Elias reached the finish line. He had taken a chance at 333 km and cracked it in the very first attempt. He completed the race in 70 hours, 39 minutes. V.S. Ramachandran was part of Alex’s support team for the first half of the race. “ I was sure from start that Alex would complete the run,’’ he said. The thing about La Ultra is that because it is an extended commitment, it forges bonds. “ I think we are all sad that it’s over,’’ Alex said after the awards ceremony on August 15. “ Post-race blues,’’ Grant said smiling. 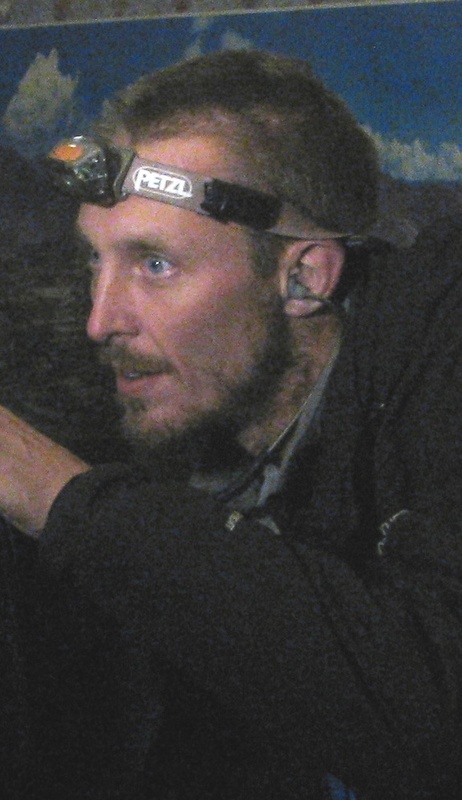 Mark felt Grant is among the toughest adventure racers in his age category at present in the world. Grant thought of himself as a gypsy. This life – hopping from one race to another, encountering different cultures, enjoying the company of ultramarathon runners – suited him. He hadn’t worked the past six months. He had invested his earnings such that he could keep race-hopping. But resources were running out and he knew he would have to skipper a boat or two to further the gypsy life. I asked him if he had anticipated his troubles at Khardung La. “ I thought I went in good considering I acclimatized well and the distance seemed doable. It surprised me that the altitude got to me. There are quite a few bits and pieces of the race that I can’t remember,’’ he said. About Jovica he said, the Serbian is a talented runner, somebody to watch out for. As for La Ultra itself, Grant felt “ it is really, really extreme.’’ But describing any race as `toughest in the world,’ more than one runner cautioned, would be incorrect, for at day’s end perceptions are personal. I asked Elena if she would return to being on the support crew for Mark, now that she had made her debut at the job in Ladakh. A photographer, she didn’t consider herself a sportsperson. She wasn’t sure she would repeat the experience. People are different; some are into sports, some are creative. What each one is should be respected. She said of Mark, “ if he is angry or upset, you give him his running shoes. He goes out for a run, he is calm again.’’ Late August 2016 – I searched for Grant Maughan on the 2016 Leadville Trail 100 results. A week after La Ultra, he had finished second in his age category at Leadville. In May 2016, a set of events underway since February that year resulted in a message dispatched from headquarters to all the commands of the Indian Navy. It sought volunteers to represent the navy in an ultramarathon. For a force used to life at sea and deployed at bases along the seashore, the ultramarathon in question was at elevation; its altitudes ranged from 10,000 ft to 17,500 ft. The person responsible for this situation was Captain Rajesh Wadhwa. Since 2004, he had been into running, progressing through a clutch of half marathons and full marathons to the ultramarathon. “ I used to think the full marathon is the longest distance around for running. It was an eye opener learning of the still longer distances people run,’’ he said. Capt. Rajesh’s first proper ultramarathon was a run of 80 km near Delhi, part of the 2014 Bhatti Lakes Ultramarathon. “ The dream was to run those races where fewer people queued up,’’ he said. Among the things he liked about the ultramarathon was its demographic profile – it was a mix of ages; not the brute dominance by youth you typically associate with sports. Further, as the distance to run grew with rising need for endurance alongside, the older, experienced runner wasn’t a push over. He / she clearly had something to bring to the table in an ultramarathon. Having successfully completed the Bhatti Lakes 80 km run (he completed it in 12:33 hours to finish third), Capt. Rajesh did a couple of shorter ultramarathons. But the euphoria was short lived. His attempt at a longer distance – 100 km – at the next edition of Bhatti Lakes ended in Did Not Finish (DNF). Unwell, he had to withdraw from the race at around kilometer-60. In February 2016, he found himself in Mussoorie, running Garhwal Runs, a 76km uphill of a race from Mussoorie to Dhanolti. The event was also a qualifier for the 111 km-category of La Ultra, the ultramarathon in Ladakh with three race categories –111 km, 222 km and 333 km. The overall cut off time for the Garhwal Runs-76 km was 12 hours. But if you did it in 10 hours, you qualified for the 111 km-segment of La Ultra. “ I started the race with no expectations. When I got tired, I walked fast. I kept moving. After several hours, I realized I was running second. That was when I asked: oh my God, what’s happening? A little later I caught up with the leader. He was walking. Seeing me, he picked up pace. I gave the guy a good chase. He was a youngster, as old as my son. Then at some point, I turned the last corner and there was the finish line. I crossed it bang on the tenth hour. That was fantastic!’’ Capt. Rajesh said. He was not only podium finisher; he was eligible to run the 111 km-category in La Ultra. On return to office in New Delhi, he applied for permission to participate in the ultramarathon in Ladakh, representing the Indian Navy. Intrigued by ultramarathon, the navy’s adventure cell recommended a team. Until then, the navy’s officers and employees had participated in ultramarathons in their personal capacity. Procedure required that the event organizers extend an invitation to the Indian Navy, so that the invitation to an organization – as opposed to an individual – would create sufficient grounds to float a team. 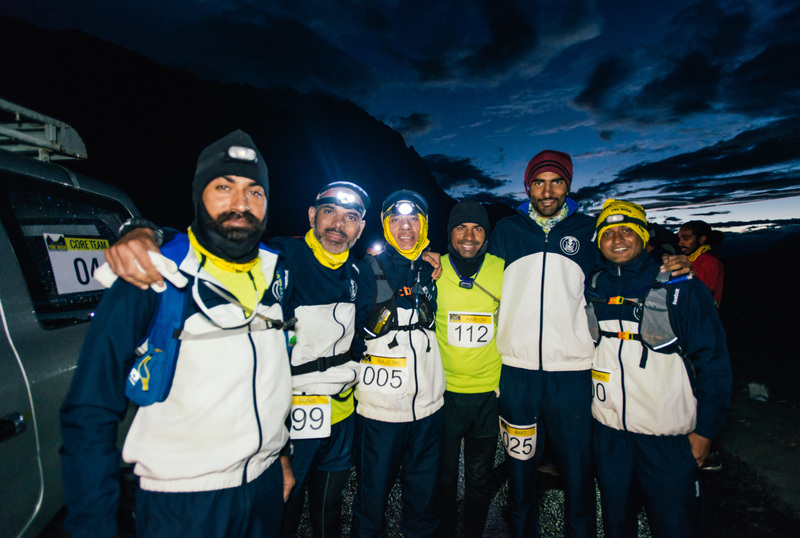 The organizers of La Ultra invited the Indian Navy to participate in the event’s 111km race. Invitation secured, the navy dispatched its message of May 2016, seeking volunteers. Running is a common human activity and in the forces, it is a tradition from training days. But there is a huge difference between those training runs, the later runs to stay fit and an ultramarathon. Not many realize this. In response to the navy’s call for volunteers, some 20-25 persons stepped forward. More interesting and rather revealing of how little understood the ultramarathon is – there were applicants enthusiastic to run La Ultra’s 222 km and 333 km races as well. The navy realized it had a job on its hands. The number of volunteers had to be trimmed to about 6-8 persons and the selection process required to mimic some of the challenges of an ultramarathon so that the volunteers stayed aware of what they were getting into. In Mumbai, Commander Sunil Handa – he and Capt. Rajesh had run together before in Vizag – had earned a reputation in the city’s running circles as an ultramarathon runner. He is also a mountaineer. 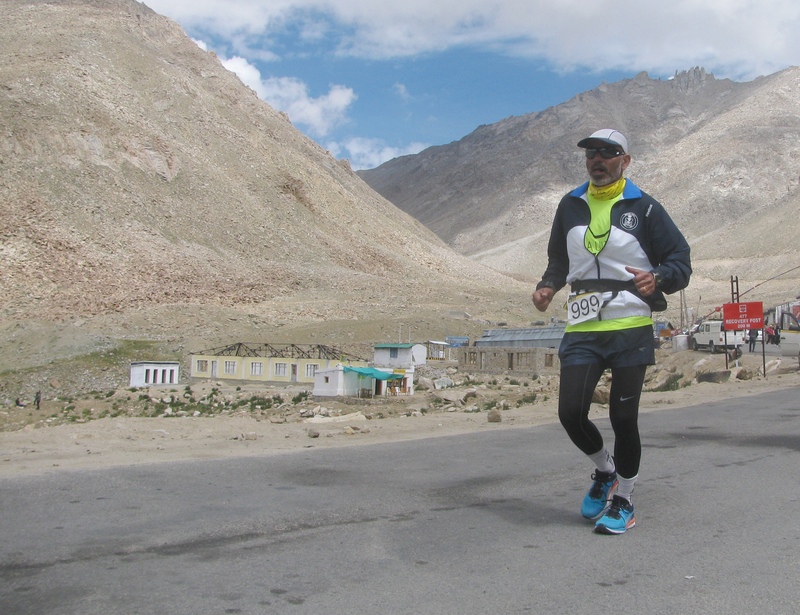 In 2015, he had run the Khardung La Challenge – an ultramarathon of little over 70 km, held every September in Ladakh. Focusing on the challenge offered by the pass, the route spans Khardung village, up and over Khardung La, on to Leh. While preparing for the ultramarathon, Cdr. Sunil ran the 2015 Mumbai Ultra, an annual 12 hour-endurance run held on a stretch from Shivaji Park to Worli sea face, in the city. Impressed by this and seeking to run with him thereafter, was Petty Officer Hari Om from the Indian Navy. He was also a mountaineer. The following September, both Cdr. 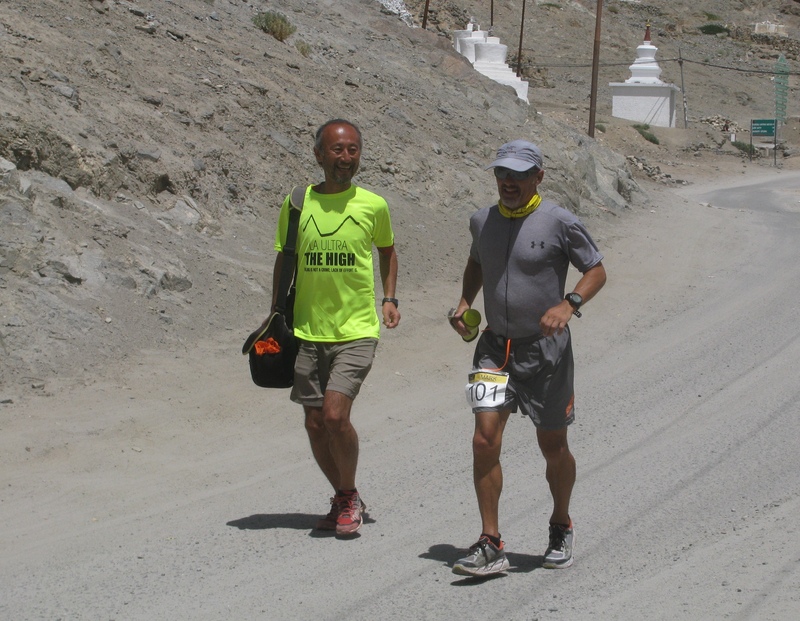 Sunil and Hari Om completed the Khardung La Challenge, Hari Om finishing just outside the cut off time. Familiar with mountains and mountaineering, the two had followed an acclimatization schedule ahead of the run, which included an ascent of the 20,182 ft-Stok Kangri, albeit a cheeky and not to be recommended fast ascent of the peak. Rajesh knew that he could count on these two runners from Mumbai to be part of the proposed team. Problem was with selecting the others. Getting all the volunteers to assemble in one place for selection was difficult as they had their official responsibilities to attend to. It was decided to take the selection to them; have the trials where the volunteers are. With those overseeing sports at the various commands struggling to comprehend what they should look for in a potential candidate for this little known discipline called the ultramarathon, Cdr. Sunil was tasked with the selection in areas under the Mumbai based-Western Naval Command. For the rest of the commands, Capt. Rajesh decided to do the selection himself. As he was based in Delhi, he counted on technology and his knowledge of the running routes at the various commands, to oversee the process. On the average, Cdr. Sunil said, the volunteers ran 70-80 km during the selection trials. Where possible, they ran on routes Capt. Rajesh suggested (for instance, he knew the routes in Vizag very well, including how to combine inclines and flats for a route offering a miniature experience of what an ultramarathon entails). The runners used WhatsApp to update him real time. “ Since I wasn’t there in person, there was a lot of trust involved,’’ Cdr. Sunil said. It was a selection process that saw navy runners tackle long distances amid official duties, family responsibilities including children’s exams and even the monsoon (the trial run in Kochi had to be postponed owing to heavy rain). 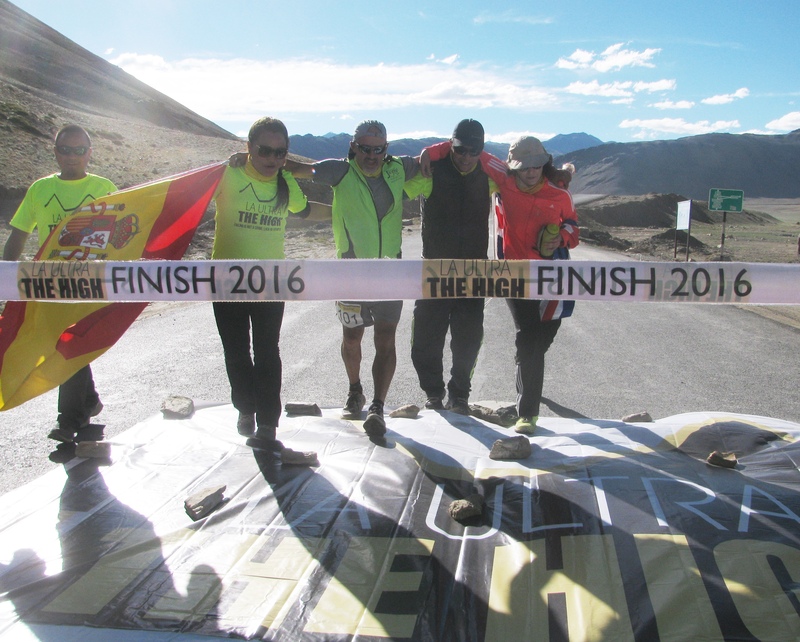 Late July, a team of six runners met up in Delhi and proceeded to Leh. Captain Rajesh Wadhwa, Commander Sunil Handa, Commander Navneet Nagi, Lieutenant Commander Kanishka Chandel, Lieutenant Amit Kumar and Petty Officer Hari Om, – they became the first official team from the Indian Navy headed for an ultramarathon. Taking a leaf from the previous trip of Sunil and Hari Om to Ladakh for the Khardung La Challenge, the team decided to do the Markha Valley trek with a climb of Kang Yatse II for acclimatization. The navy’s adventure cell arranged required gear. After the mandatory rest period in Leh, the team commenced its trek. One of the highlights of this hike to get used to altitude was doing yoga at elevation. However, the day they set out for the summit of Kang Yatse II, Capt. Rajesh had to make a choice. Except for Cdr. Sunil and Hari Om, none of the others were mountaineers. On the other hand, they were all runners and they had all come to Ladakh to run an ultramarathon. It raised a simple question: does the team climb Kang Yatse II all the way to the top or does it focus on the need to acclimatize and save its energies for the ultramarathon? On the mountain, when they were as high as Khardung La (the highest point on the La Ultra course), Capt. Rajesh posed the question to his team: what is the best option? Eventually Hari Om went on to summit the peak while everyone else proceeded back to camp. 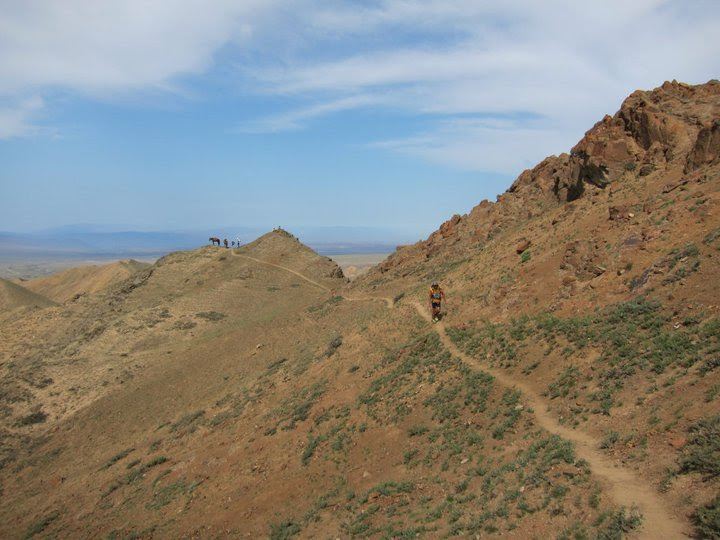 That reminder about running made sense, for the next day, in the vast, relatively flat terrain of Markha Valley, the team members spent their time doing yoga and running. Armed with these preparations and a team song they had composed during the hike, they returned to Leh for a few days of proper rest. On August 9, there was a meet up of all those participating in the 2016 edition of La Ultra. Capt. Rajesh introduced the navy’s ultramarathon team with characteristic humour. 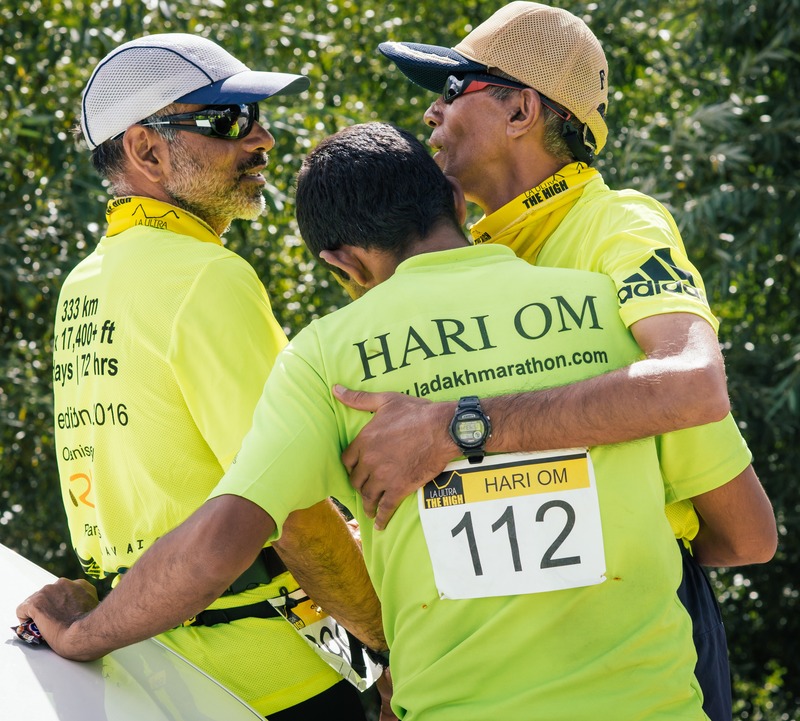 Referring to the team and its mix of varied age and experience, he said, “ I am the team’s daddy, Sunil, the uncle and Amit, the kid.’’ The next day everyone proceeded to Diskit, where the start line of the ultramarathon was. Amid the short walks around Diskit to get used to the environment, Capt. Rajesh remembers getting several messages from friends and supporters, wishing the team luck. He also had an infected blister on his hand – got from using an ice axe on Kang Yatse – lanced, drained and dressed by the race medics. The race began on the night of August 11. According to Cdr. 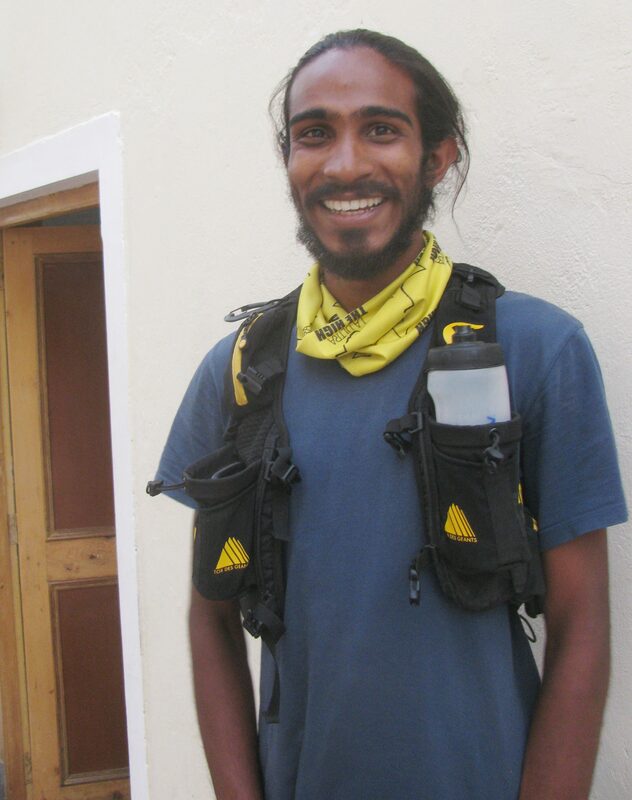 Sunil, although he and Hari Om had run up and over Khardung La before, the La Ultra version of the experience with start in Diskit, made the run more challenging. 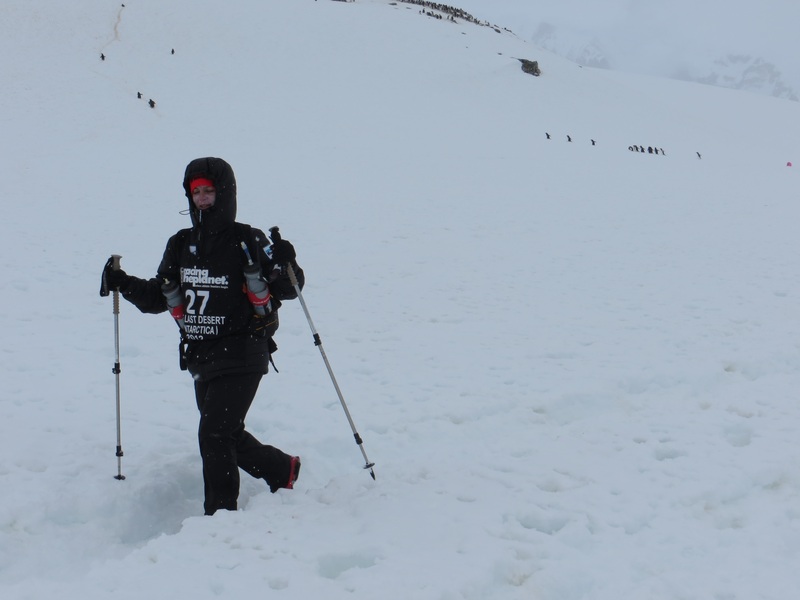 It increased the distance and overall height gain to Khardung La and with the race commencing at night, he was forced to cope with something he hadn’t tackled before in a run or trained for – sleep deprivation. “ Between North Pullu and Khardung La, around two kilometers from the top, I was really in need of sleep,’’ he said of that passage through elevation and cold. Pass done and descent to Leh commenced, his condition improved. Meanwhile, in the distance between Diskit and North Pullu, two runners from the navy team had failed to meet stage cut-offs. They were eliminated from the race. Capt. Rajesh – Hari Om with him – was having a tough time. The initial portion of the race had gone off well for him. Past kilometer-30, the two even did some yoga. But somewhere on the approach to North Pullu, Capt. Rajesh had sensed the pace slackening. There was a sense of daunting task, growing. At the same time, the 52 year-old knew that the onus of the team’s performance rested on him for he was skipper. He pushed on as best as he could. He reached North Pullu tired and out of breath. The race medics hovered around him. They checked on the runner. Before Khardung La, two to three bends below the pass on the North Pullu side – at the spot where Polish runner Dariusz (Darek) Strychalski was taken off the race – the Race Director spoke to Capt. Rajesh. There was concern that he was pushing his limits a bit too far. The naval officer told Hari Om to carry on. Then he explained how as a military man he cannot give up, how much he owed to those who had wished him well for this run. A little later, he resumed his trudge to the pass. In retrospect, that was a turning point. As a new day dawned and Ladakh’s sun revealed the surrounding topography, the runners diminished to minor detail on big mountain. Some hours later at South Pullu on the other side of Khardung La, Race Director, Dr Rajat Chauhan took his position to count down the stage cut off for that section. Enforcing stage cut off is a heartless job; it is door shut and no looking back. Making it home with minutes to spare was Capt. Rajesh. Before South Pullu, with about 15 minutes left for stage cut-off, he had given that portion of the race all he had. “ That third cut-off – that was the toughest stage for me,’’ Capt. Rajesh would say later. Right then it meant, the navy had successfully preserved its surviving quartet. Ahead on the race’s final stretch, proceeding to a comfortable finish were Lt. Amit, Cdr. Sunil and Hari Om. Nick Dillon and Tim Berrow, the race’s medical team, were impressed. “ Capt. Rajesh Wadhwa was a concern. He was exhausted. He was just very, very tired. But he wasn’t medically unfit to continue. I gave him one chance to continue. He took that chance and made the most of it,’’ Nick said. Earlier, when Capt. 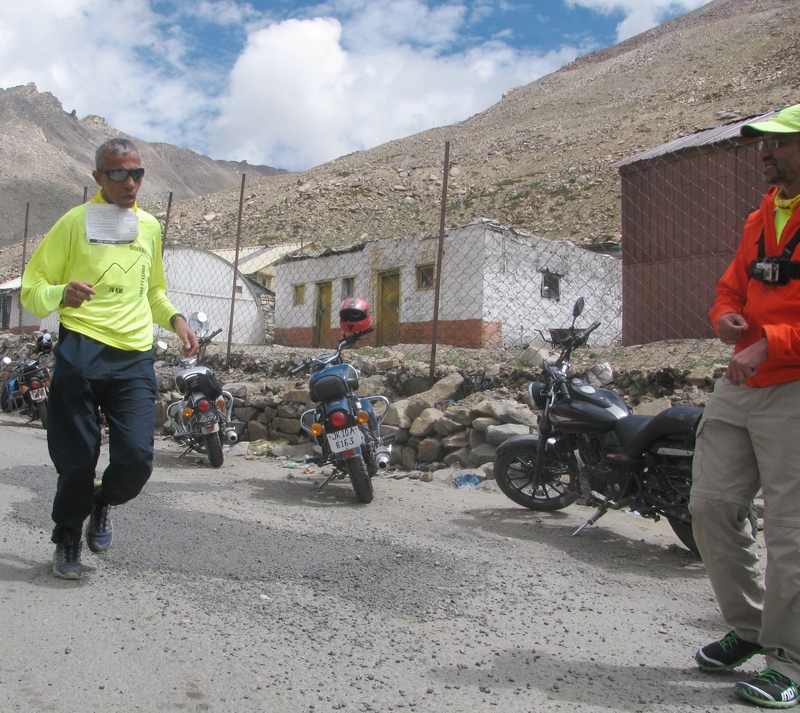 Rajesh halted before Khardung La to chat with the Race Director, a small but significant step occurred. He told Hari Om to go ahead. While young ultramarathon runner, Kieren D’ Souza smashed the course record to finish 111km in 15:30 hours, Hari Om, tapping into some new found energy, finished a creditable third giving the Indian Navy a place on the podium. Altogether, four members of the Indian Navy team – Hari Om (19:04 hours), Cdr. Sunil (19:20), Lt. Amit (19:30) and Capt. 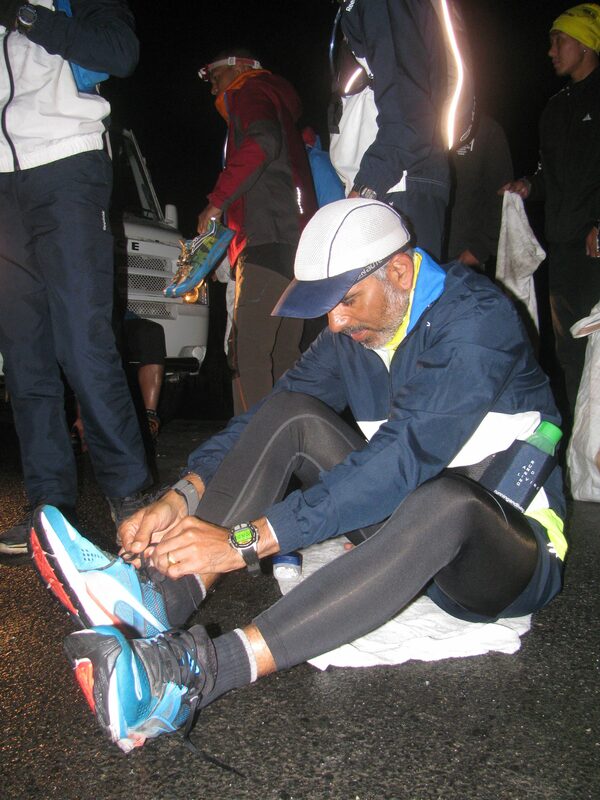 Rajesh (19:33) – completed the 111km-race, the navy’s first official participation as a team in an ultramarathon. Now that they have a team in place, the navy plans to run more ultramarathons. For starters, they have their eyes on attempting one of the two ultramarathons in the Rann of Kutch. “ This is the beginning of a journey,’’ Capt. Rajesh said.